Download "INSTALLATION GUIDE. 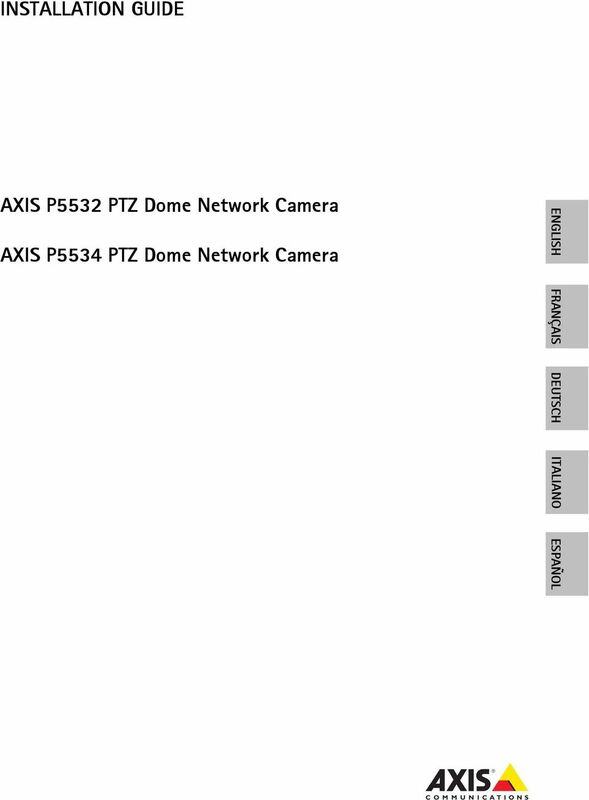 AXIS P5532 PTZ Dome Network Camera. AXIS P5534 PTZ Dome Network Camera ENGLISH FRANÇAIS DEUTSCH ITALIANO ESPAÑOL"
2 Legal Considerations Video and audio surveillance can be prohibited by laws that vary from country to country. Check the laws in your local region before using this product for surveillance purposes. This product includes one (1) H.264 decoder license. To purchase further licenses, contact your reseller. Electromagnetic Compatibility (EMC) This equipment generates, uses and can radiate radio frequency energy and, if not installed and used in accordance with the instructions, may cause harmful interference to radio communications. However, there is no guarantee that interference will not occur in a particular installation. If this equipment does cause harmful interference to radio or television reception, which can be determined by turning the equipment off and on, the user is encouraged to try to correct the interference by one or more of the following measures: Re-orient or relocate the receiving antenna. Increase the separation between the equipment and receiver. Connect the equipment to an outlet on a different circuit to the receiver. Consult your dealer or an experienced radio/tv technician for help. Shielded (STP) network cables must be used with this unit to ensure compliance with EMC standards. USA - This equipment has been tested and found to comply with the limits for a Class B computing device pursuant to Subpart B of Part 15 of FCC rules, which are designed to provide reasonable protection against such interference when operated in a commercial environment. Operation of this equipment in a residential area is likely to cause interference, in which case the user at his/her own expense will be required to take whatever measures may be required to correct the interference. Canada - This Class B digital apparatus complies with Canadian ICES-003 Europe - This digital equipment fulfills the requirements for radiated emission according to limit B of EN55022, and the requirements for immunity according to EN55024 residential and commercial industry. Japan - This is a class B product based on the standard of the Voluntary Control Council for Interference from Information Technology Equipment (VCCI). If this is used near a radio or television receiver in a domestic environment, it may cause radio interference. Install and use the equipment according to the instruction manual. Australia - This electronic device meets the requirements of the Radio communications (Electromagnetic Compatibility) Standard AS/NZS CISPR22:2002. Korea - Class B: As this equipment has obtained EMC registration for household use, it can be used in any area including residential areas. Safety Complies to EN (IEC ), Safety of Information Technology Equipment. Equipment Modifications This equipment must be installed and used in strict accordance with the instructions given in the user documentation. This equipment contains no user-serviceable components. Unauthorized equipment changes or modifications will invalidate all applicable regulatory certifications and approvals. Liability Every care has been taken in the preparation of this document. Please inform your local Axis office of any inaccuracies or omissions. Axis Communications AB cannot be held responsible for any technical or typographical errors and reserves the right to make changes to the product and documentation without prior notice. Axis Communications AB makes no warranty of any kind with regard to the material contained within this document, including, but not limited to, the implied warranties of merchantability and fitness for a particular purpose. Axis Communications AB shall not be liable nor responsible for incidental or consequential damages in connection with the furnishing, performance or use of this material. RoHS This product complies with both the European RoHS directive, 2002/95/EC, and the Chinese RoHS regulations, ACPEIP. 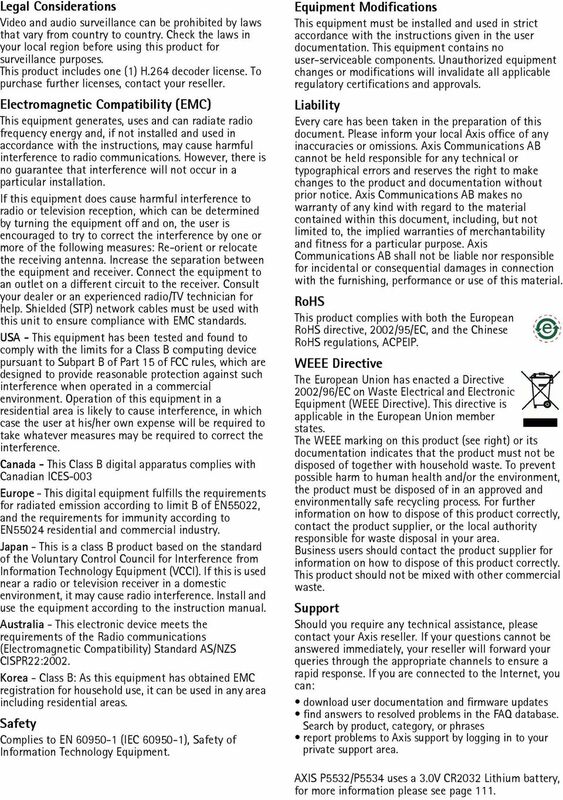 WEEE Directive The European Union has enacted a Directive 2002/96/EC on Waste Electrical and Electronic Equipment (WEEE Directive). This directive is applicable in the European Union member states. The WEEE marking on this product (see right) or its documentation indicates that the product must not be disposed of together with household waste. To prevent possible harm to human health and/or the environment, the product must be disposed of in an approved and environmentally safe recycling process. For further information on how to dispose of this product correctly, contact the product supplier, or the local authority responsible for waste disposal in your area. Business users should contact the product supplier for information on how to dispose of this product correctly. This product should not be mixed with other commercial waste. Support Should you require any technical assistance, please contact your Axis reseller. If your questions cannot be answered immediately, your reseller will forward your queries through the appropriate channels to ensure a rapid response. If you are connected to the Internet, you can: download user documentation and firmware updates find answers to resolved problems in the FAQ database. Search by product, category, or phrases report problems to Axis support by logging in to your private support area. AXIS P5532/P5534 uses a 3.0V CR2032 Lithium battery, for more information please see page 111. 6 Page 6 AXIS P5532/P5534 Installation Guide Install the hardware! IMPORTANT! - To use AXIS P5532/P5534 outdoors, it must be installed in an approved outdoor housing. Please see for more information on outdoor housing. Prepare for installation Read all the instructions before preparing to install AXIS P5532/P5534 since several installation preparation steps require removing the top cover and would benefit from being completed together. Follow the instructions Remove the protective packaging, below to remove the protective packing before installing the camera. The camera is supplied with a clear transparent cover and a smoked transparent cover. If required, follow the instructions Replace the clear/smoked dome cover (optional), below to replace the dome cover. A standard or high capacity SD card (not included) is required to store images locally in the network camera. Follow the instructions Install an SD card (optional), below to remove the top cover and install an SD card. Remove the protective packaging 1. Loosen the 4 top cover screws and remove the top cover, see illustration on page Remove the protective packaging. Protective packaging 3. 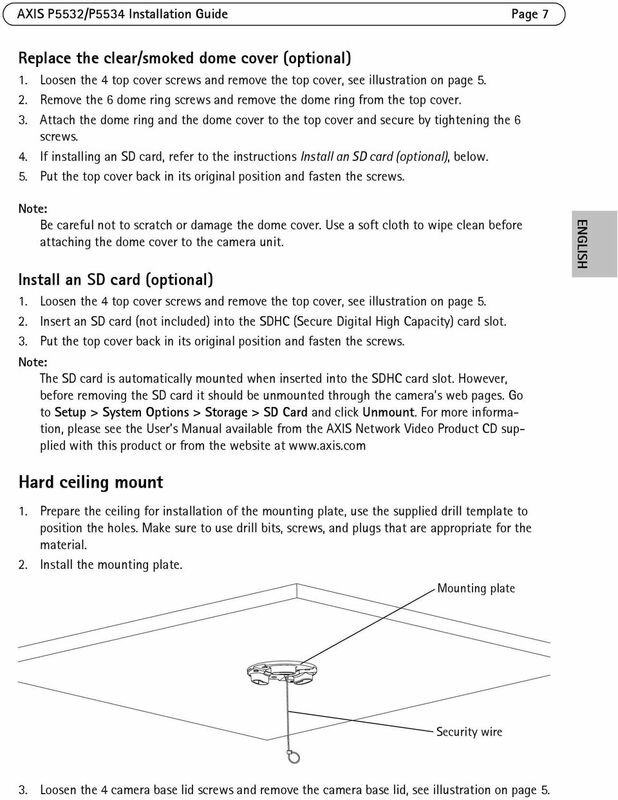 If replacing the clear/smoked dome cover or installing an SD card, refer to the instructions Replace the clear/smoked dome cover (optional) and Install an SD card (optional), below. 4. Put the top cover back in its original position and fasten the screws. 7 AXIS P5532/P5534 Installation Guide Page 7 Replace the clear/smoked dome cover (optional) 1. Loosen the 4 top cover screws and remove the top cover, see illustration on page Remove the 6 dome ring screws and remove the dome ring from the top cover. 3. Attach the dome ring and the dome cover to the top cover and secure by tightening the 6 screws. 4. If installing an SD card, refer to the instructions Install an SD card (optional), below. 5. Put the top cover back in its original position and fasten the screws. Note: Be careful not to scratch or damage the dome cover. Use a soft cloth to wipe clean before attaching the dome cover to the camera unit. Install an SD card (optional) 1. Loosen the 4 top cover screws and remove the top cover, see illustration on page Insert an SD card (not included) into the SDHC (Secure Digital High Capacity) card slot. 3. Put the top cover back in its original position and fasten the screws. Note: The SD card is automatically mounted when inserted into the SDHC card slot. However, before removing the SD card it should be unmounted through the camera s web pages. Go to Setup > System Options > Storage > SD Card and click Unmount. 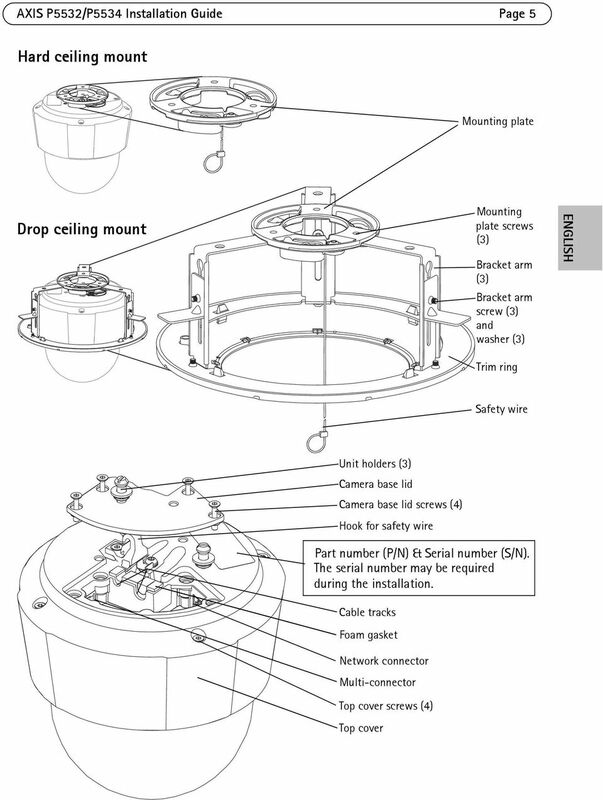 For more information, please see the User s Manual available from the AXIS Network Video Product CD supplied with this product or from the website at ENGLISH Hard ceiling mount 1. Prepare the ceiling for installation of the mounting plate, use the supplied drill template to position the holes. Make sure to use drill bits, screws, and plugs that are appropriate for the material. 2. Install the mounting plate. Mounting plate Security wire 3. Loosen the 4 camera base lid screws and remove the camera base lid, see illustration on page 5. 8 Page 8 AXIS P5532/P5534 Installation Guide 4. Route and connect the network cable and the multi-connector cable, if applicable, to the network camera. Be careful not to damage the cables when connecting them. Make sure the foam gasket holes are aligned with the cable tracks and, if applicable, remove the cut-out piece for the multi-connector cable from the foam gasket. 5. Put the camera base lid back in its original position and fasten the screws. 6. Secure the camera using the supplied safety wire. 7. Slide the unit holders on the network camera into the slots on the mounting plate and rotate the camera unit. 8. Install the High PoE Midspan 1-Port, see Install the AXIS T8123 High PoE Midspan 1-port, on page Check that the indicator LEDs on the midspan indicate the correct conditions, see the table on page 21 for further details. 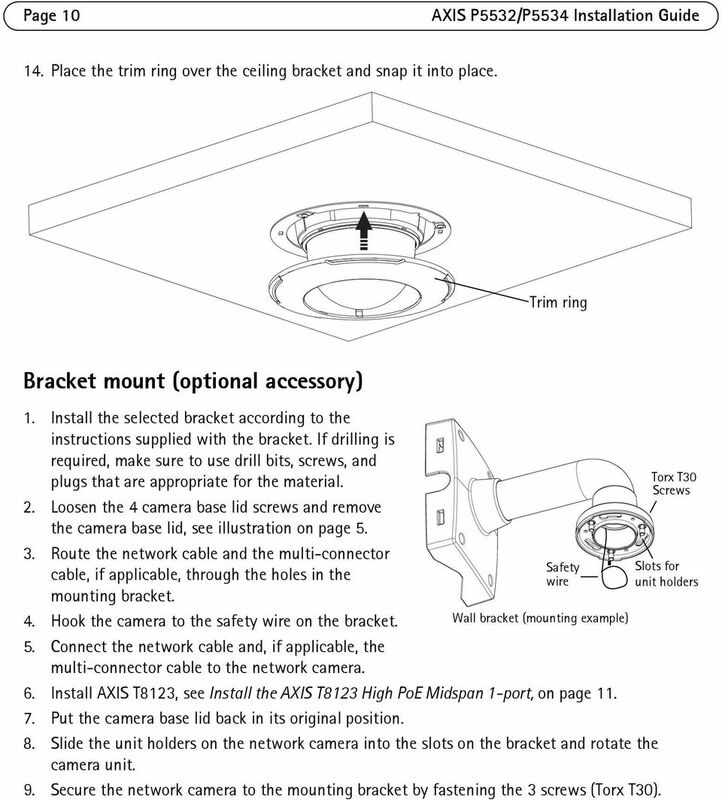 Drop ceiling mount 1. Remove the ceiling tile in which the drop ceiling mount is to be fitted. 2. Use the supplied template to mark the position for the 210 mm (8.3 in.) hole in the ceiling tile. Cut around the template. Ceiling tile Hole diameter 210 mm (8.3 in.) Notes: The combined weight of the camera and ceiling mount is approximately 2.3 kg (5.1 lb.). Check that the ceiling material is strong enough to support this weight. The ceiling tile should be 5 mm 60 mm (0.2 in. 2.4 in.) thick. 3. Assemble the ceiling bracket. 4. Put the ceiling bracket into the ceiling tile, see illustration on page Tighten the bracket arm screws using a torx 20 screwdriver head. 6. Loosen the 4 camera base lid screws and remove the camera base lid, see illustration on page 5. 9 AXIS P5532/P5534 Installation Guide Page 9 7. Route and connect the network cable and the multi-connector cable, if applicable, to the network camera. Be careful not to damage the cables when connecting them. Make sure the foam gasket holes are aligned with the cable tracks and, if applicable, remove the cut-out piece for the multi-connector cable from the foam gasket. Multi-connector cable Network cable ENGLISH 8. Put the camera base lid back in its original position and fasten the screws. 9. Secure the camera using the supplied safety wire. Ceiling bracket Safety wire Ceiling tile 10. Slide the unit holders on the network camera into the slots on the mounting plate and rotate the camera unit. 11. Install the High PoE Midspan 1-Port, see Install the AXIS T8123 High PoE Midspan 1-port, on page Check that the indicator LEDs on the midspan indicate the correct conditions. See the table on page 21 for further details. 13. Install the ceiling tile, with the camera mounted, into the ceiling. 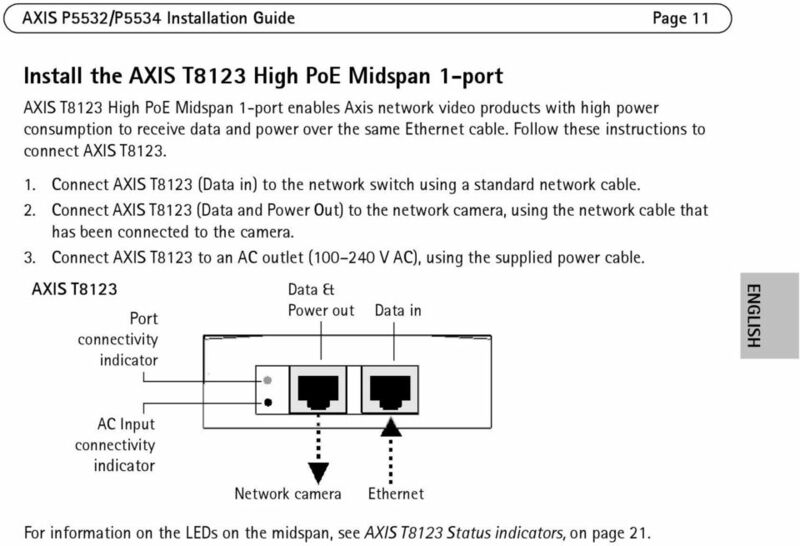 11 AXIS P5532/P5534 Installation Guide Page 11 Install the AXIS T8123 High PoE Midspan 1-port AXIS T8123 High PoE Midspan 1-port enables Axis network video products with high power consumption to receive data and power over the same Ethernet cable. Follow these instructions to connect AXIS T Connect AXIS T8123 (Data in) to the network switch using a standard network cable. 2. Connect AXIS T8123 (Data and Power Out) to the network camera, using the network cable that has been connected to the camera. 3. Connect AXIS T8123 to an AC outlet ( V AC), using the supplied power cable. AXIS T8123 Port connectivity indicator Data & Power out Data in ENGLISH AC Input connectivity indicator Network camera Ethernet For information on the LEDs on the midspan, see AXIS T8123 Status indicators, on page 21. 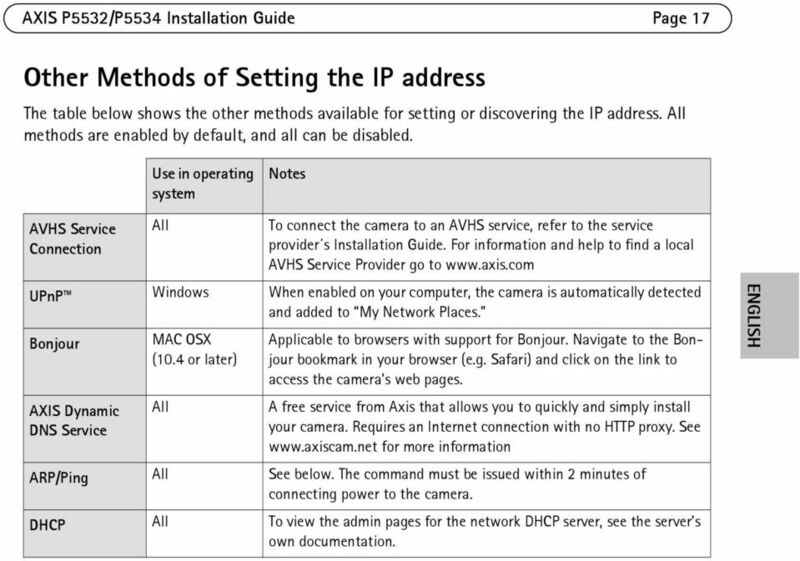 12 Page 12 AXIS P5532/P5534 Installation Guide Assign an IP Address Most networks today have a DHCP server that automatically assigns IP addresses to connected devices. If your network does not have a DHCP server the network camera will use as the default IP address. If you would like to assign a static IP address, the recommended method in Windows is either AXIS IP Utility or AXIS Camera Management. Depending on the number of cameras you wish to install, use the method that best suits your purpose. Both of these free applications are available on the AXIS Network Video Product CD supplied with this product, or they can be downloaded from Method Recommended for Operating system AXIS IP Utility See page 13 AXIS Camera Management See page 14 Single camera Small installations Multiple cameras Large installations Installation on a different subnet Windows Windows 2000 Windows XP Pro Windows 2003 Server Windows Vista Windows 7 Notes: If assigning the IP address fails, check that there is no firewall blocking the operation. For other methods of assigning or discovering the IP address, e.g. in other operating systems, see page 17. 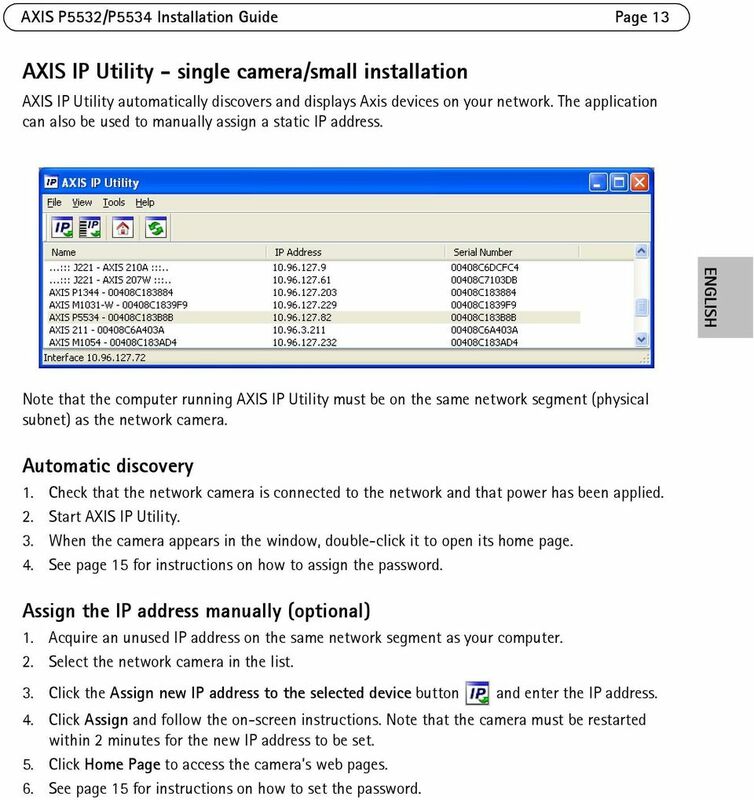 13 AXIS P5532/P5534 Installation Guide Page 13 AXIS IP Utility - single camera/small installation AXIS IP Utility automatically discovers and displays Axis devices on your network. The application can also be used to manually assign a static IP address. 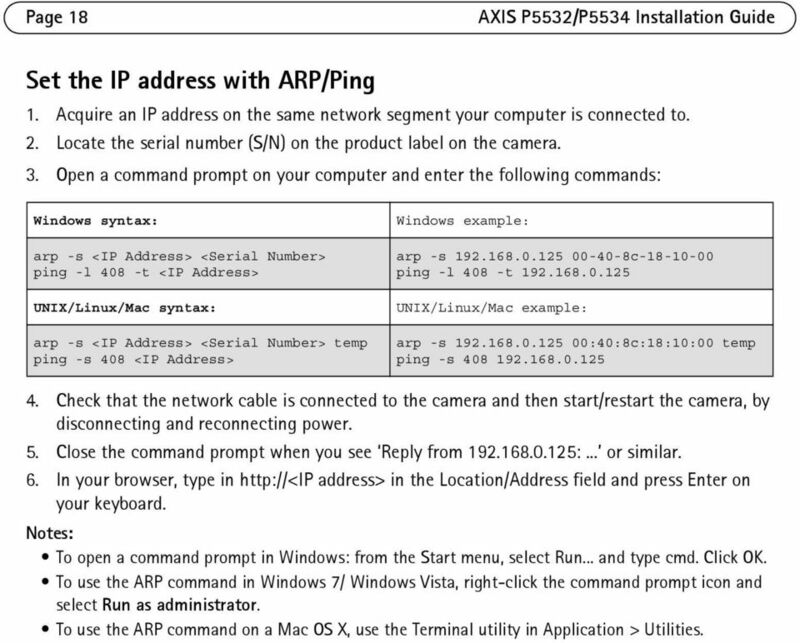 ENGLISH Note that the computer running AXIS IP Utility must be on the same network segment (physical subnet) as the network camera. Automatic discovery 1. Check that the network camera is connected to the network and that power has been applied. 2. Start AXIS IP Utility. 3. When the camera appears in the window, double-click it to open its home page. 4. 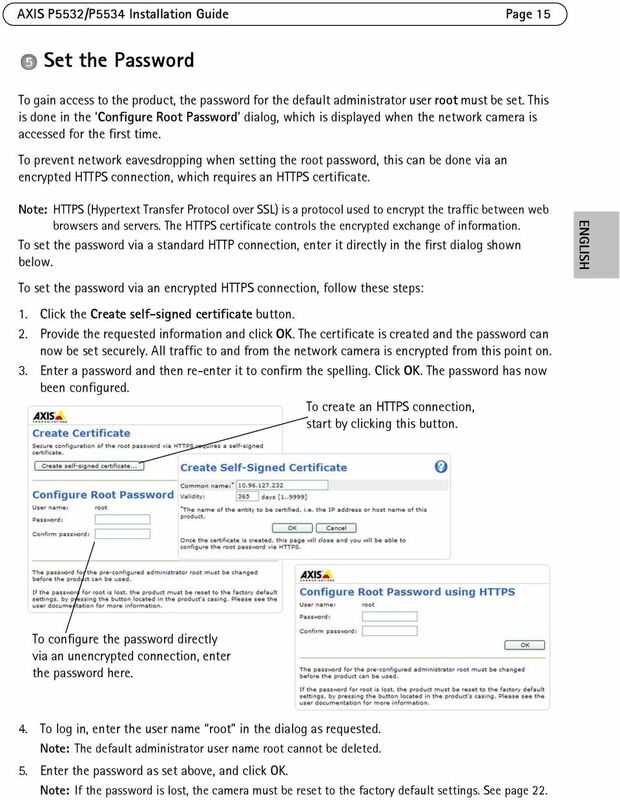 See page 15 for instructions on how to assign the password. Assign the IP address manually (optional) 1. Acquire an unused IP address on the same network segment as your computer. 2. Select the network camera in the list. 3. Click the Assign new IP address to the selected device button and enter the IP address. 4. Click Assign and follow the on-screen instructions. Note that the camera must be restarted within 2 minutes for the new IP address to be set. 5. Click Home Page to access the camera s web pages. 6. See page 15 for instructions on how to set the password. 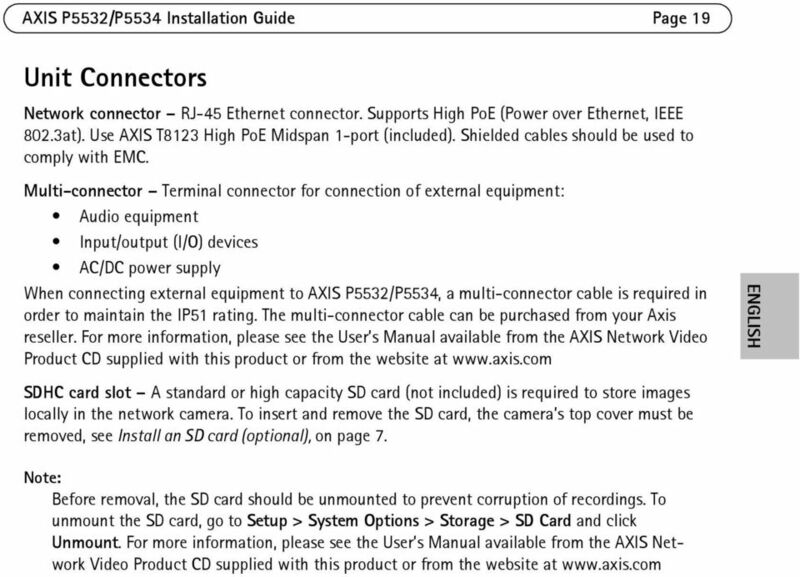 14 Page 14 AXIS P5532/P5534 Installation Guide AXIS Camera Management - multiple cameras/large installations AXIS Camera Management can automatically discover multiple Axis devices, show connection status, manage firmware upgrades and set IP addresses. Automatic discovery 1. Check that the camera is connected to the network and that power has been applied. 2. Start AXIS Camera Management. When the network camera appears in the window, right-click the link and select Live View Home Page. 3. See page 15 for instructions on how to set the password. Assign an IP address in a single device 1. 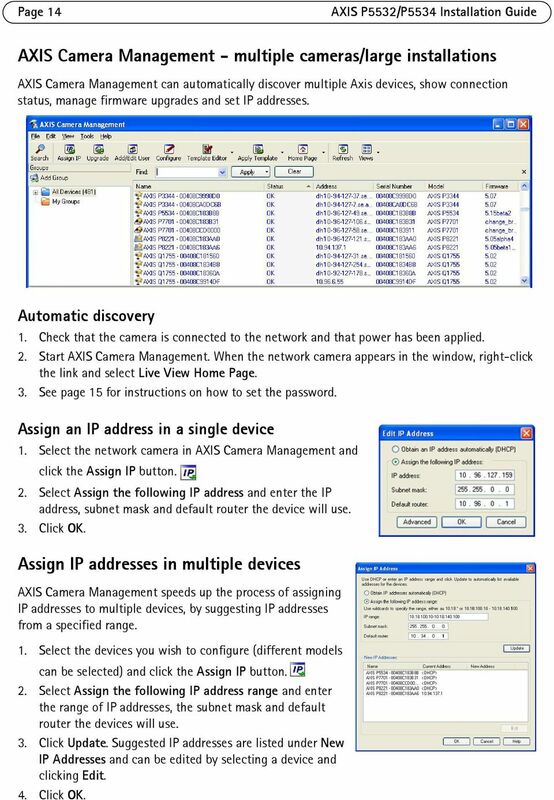 Select the network camera in AXIS Camera Management and click the Assign IP button. 2. Select Assign the following IP address and enter the IP address, subnet mask and default router the device will use. 3. Click OK. Assign IP addresses in multiple devices AXIS Camera Management speeds up the process of assigning IP addresses to multiple devices, by suggesting IP addresses from a specified range. 1. Select the devices you wish to configure (different models can be selected) and click the Assign IP button. 2. Select Assign the following IP address range and enter the range of IP addresses, the subnet mask and default router the devices will use. 3. Click Update. Suggested IP addresses are listed under New IP Addresses and can be edited by selecting a device and clicking Edit. 4. Click OK.
15 AXIS P5532/P5534 Installation Guide Page 15 Set the Password To gain access to the product, the password for the default administrator user root must be set. This is done in the Configure Root Password dialog, which is displayed when the network camera is accessed for the first time. To prevent network eavesdropping when setting the root password, this can be done via an encrypted HTTPS connection, which requires an HTTPS certificate. Note: HTTPS (Hypertext Transfer Protocol over SSL) is a protocol used to encrypt the traffic between web browsers and servers. The HTTPS certificate controls the encrypted exchange of information. To set the password via a standard HTTP connection, enter it directly in the first dialog shown below. ENGLISH To set the password via an encrypted HTTPS connection, follow these steps: 1. Click the Create self-signed certificate button. 2. Provide the requested information and click OK. The certificate is created and the password can now be set securely. All traffic to and from the network camera is encrypted from this point on. 3. Enter a password and then re-enter it to confirm the spelling. Click OK. The password has now been configured. To create an HTTPS connection, start by clicking this button. To configure the password directly via an unencrypted connection, enter the password here. 4. To log in, enter the user name root in the dialog as requested. Note: The default administrator user name root cannot be deleted. 5. Enter the password as set above, and click OK. Note: If the password is lost, the camera must be reset to the factory default settings. See page 22. 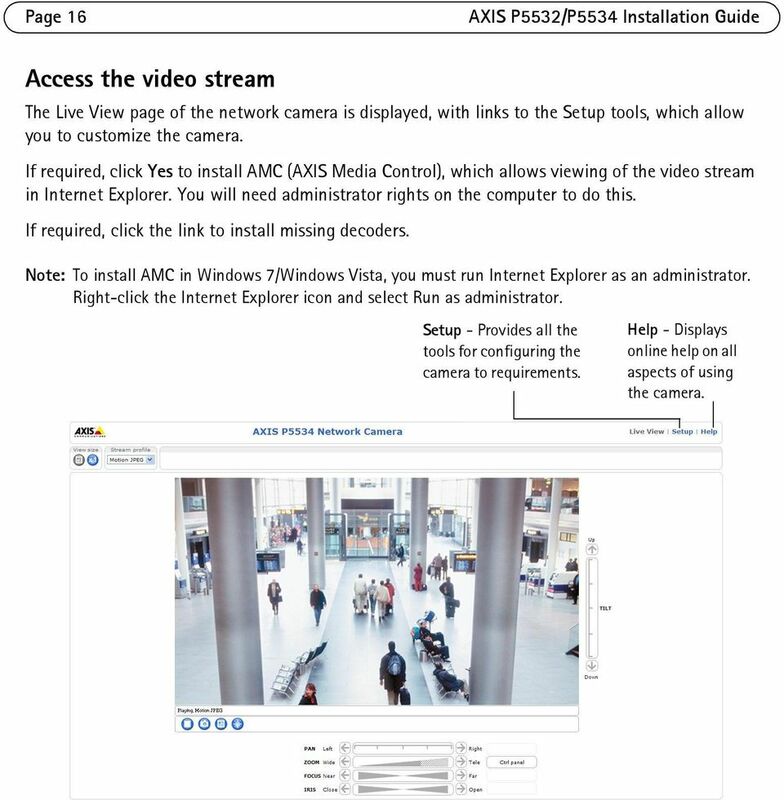 16 Page 16 AXIS P5532/P5534 Installation Guide Access the video stream The Live View page of the network camera is displayed, with links to the Setup tools, which allow you to customize the camera. If required, click Yes to install AMC (AXIS Media Control), which allows viewing of the video stream in Internet Explorer. You will need administrator rights on the computer to do this. If required, click the link to install missing decoders. Note: To install AMC in Windows 7/Windows Vista, you must run Internet Explorer as an administrator. Right-click the Internet Explorer icon and select Run as administrator. Setup - Provides all the tools for configuring the camera to requirements. Help - Displays online help on all aspects of using the camera. 18 Page 18 AXIS P5532/P5534 Installation Guide Set the IP address with ARP/Ping 1. Acquire an IP address on the same network segment your computer is connected to. 2. Locate the serial number (S/N) on the product label on the camera. 3. Open a command prompt on your computer and enter the following commands: Windows syntax: arp -s <IP Address> <Serial Number> ping -l 408 -t <IP Address> UNIX/Linux/Mac syntax: arp -s <IP Address> <Serial Number> temp ping -s 408 <IP Address> Windows example: arp -s c ping -l 408 -t UNIX/Linux/Mac example: arp -s :40:8c:18:10:00 temp ping -s Check that the network cable is connected to the camera and then start/restart the camera, by disconnecting and reconnecting power. 5. Close the command prompt when you see Reply from :... or similar. 6. In your browser, type in address> in the Location/Address field and press Enter on your keyboard. Notes: To open a command prompt in Windows: from the Start menu, select Run... and type cmd. Click OK. To use the ARP command in Windows 7/ Windows Vista, right-click the command prompt icon and select Run as administrator. To use the ARP command on a Mac OS X, use the Terminal utility in Application > Utilities. 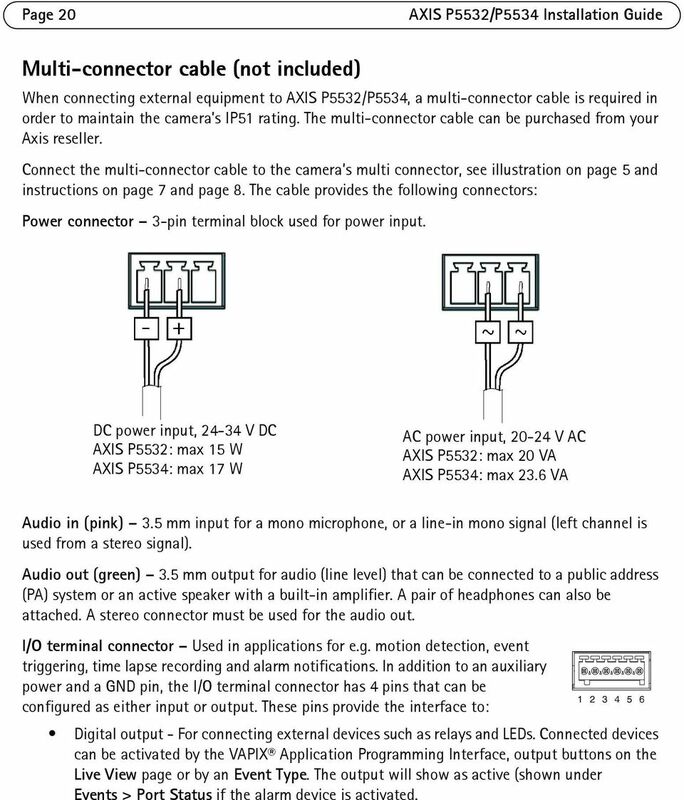 20 Page 20 AXIS P5532/P5534 Installation Guide Multi-connector cable (not included) When connecting external equipment to AXIS P5532/P5534, a multi-connector cable is required in order to maintain the camera s IP51 rating. The multi-connector cable can be purchased from your Axis reseller. 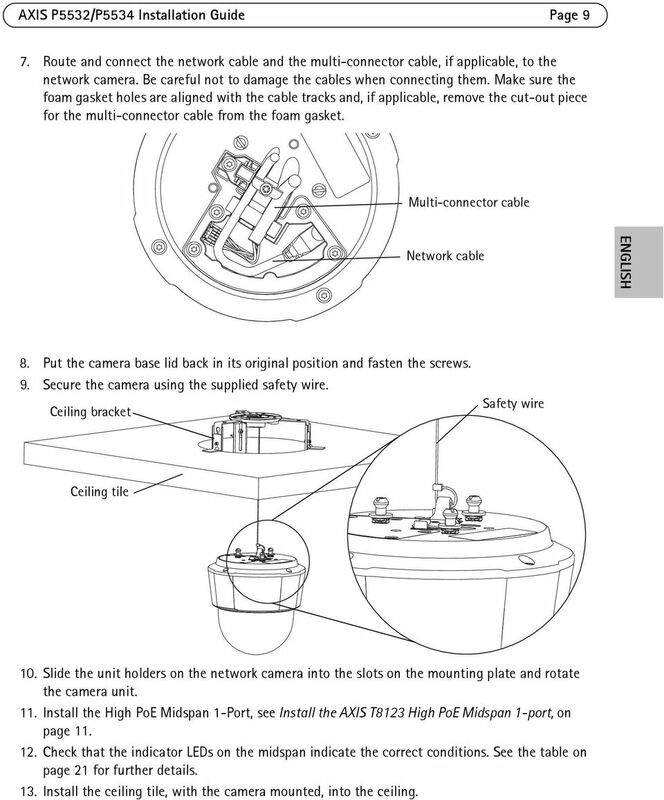 Connect the multi-connector cable to the camera s multi connector, see illustration on page 5 and instructions on page 7 and page 8. The cable provides the following connectors: Power connector 3-pin terminal block used for power input. DC power input, V DC AXIS P5532: max 15 W AXIS P5534: max 17 W AC power input, V AC AXIS P5532: max 20 VA AXIS P5534: max 23.6 VA Audio in (pink) 3.5 mm input for a mono microphone, or a line-in mono signal (left channel is used from a stereo signal). Audio out (green) 3.5 mm output for audio (line level) that can be connected to a public address (PA) system or an active speaker with a built-in amplifier. A pair of headphones can also be attached. A stereo connector must be used for the audio out. I/O terminal connector Used in applications for e.g. motion detection, event triggering, time lapse recording and alarm notifications. In addition to an auxiliary power and a GND pin, the I/O terminal connector has 4 pins that can be configured as either input or output. These pins provide the interface to: Digital output - For connecting external devices such as relays and LEDs. Connected devices can be activated by the VAPIX Application Programming Interface, output buttons on the Live View page or by an Event Type. The output will show as active (shown under Events > Port Status if the alarm device is activated. 22 Page 22 AXIS P5532/P5534 Installation Guide Resetting to the Factory Default Settings To reset the camera to the original factory default settings, use the control button and the restart button on the side of the camera, see Hardware Overview, on page 4, as described below: Using the control and restart buttons will reset all the parameters, including the IP address, to the factory default settings: 1. Remove the top cover, see Remove the protective packaging, on page Press and hold the control button and the restart button at the same time. 3. Release the restart button but continue to hold down the control button. 4. Continue to hold down the control button until the status indicator color changes to amber (this may take up to 15 seconds). 5. Release the control button. 6. When the status indicator changes to green (which may take up to 1 minute), the process is complete and the camera has been reset. The unit now has the default IP address Put the top cover back in its original position. 8. Re-assign the IP address, using one of the methods described in Assign an IP Address, on page 12. It is also possible to reset parameters to the original factory default settings via the web interface. For more information, please see the online help or the User s Manual available from the AXIS Network Video Product CD supplied with this product. Accessing the Camera from the Internet Once installed, your network camera is accessible on your local network (LAN). To access the camera from the Internet, network routers must be configured to allow incoming traffic, which is usually done on a specific port. HTTP port (default port 80) for viewing and configuration RTSP port (default port 554) for viewing H.264 video streams Please refer to the documentation for your router for further instructions. For more information on this and other topics, visit the Axis Support Web at Further Information The User s Manual is available from the Axis Web site at or from the AXIS Network Video Product CD supplied with this product. Tip! Visit to check if there is updated firmware available for your network camera. To see the currently installed firmware version, see Setup > About. 26 Page 26 AXIS P5532/P5534 Guide d'installation Installation du matériel! IMPORTANT! - Pour pouvoir utiliser la caméra AXIS P5532/P5534 à l extérieur, elle doit être placée dans un boîtier d extérieur homologué. Visitez le site pour plus d informations sur le boîtier d extérieur. Préparation de l installation Lisez toutes les instructions avant de préparer l installation la caméra AXIS P5532/P5534. En effet, de nombreuses étapes de cette préparation requièrent le retrait du couvercle supérieur et il serait plus judicieux de les effectuer ensemble. Suivez les instructions décrites dans la section Enlèvement de l emballage de protection ciaprès pour enlever l emballage de protection avant d installer la caméra. La caméra est fournie avec deux bulles transparentes (non fumée et fumée). Si nécessaire, suivez les instructions décrites dans la section Remplacement de la bulle du dôme fumée/ non fumée (facultatif) ci-après pour replacer le couvercle du dôme. Une carte SD standard ou haute capacité (non fournie) est requise pour stocker des images en local sur la caméra réseau. Suivez les instructions décrites dans la section Installation d une carte SD (facultatif) ci-après pour retirer le couvercle supérieur et installer la carte SD. Enlèvement de l emballage de protection 1. Desserrez les quatre vis du couvercle supérieur et retirez-le, voir l illustration à la page Enlèvement de l emballage de protection. Emballage de protection 3. Si vous remplacez la bulle du dôme fumée/non fumée ou installez la carte SD, suivez les instructions décrites dans les sections Remplacement de la bulle du dôme fumée/non fumée (facultatif) et Installation d une carte SD (facultatif) ci-après. 4. Remettez en place le couvercle supérieur, puis serrez les vis. 28 Page 28 AXIS P5532/P5534 Guide d'installation 3. Desserrez les quatre vis du couvercle de base de la caméra, puis retirez le couvercle, voir l illustration à la page Acheminez le câble réseau et le câble multi-connexion, le cas échéant, puis branchez-les à la caméra réseau. Veillez à ne pas endommager les câbles lors du branchement. Vérifiez que les trous sur le joint en mousse sont alignés aux passages pour câble et, le cas échéant, enlevez l échancrure du joint en mousse pour laisser passer le câble multi-connexion. 5. Remettez en place le couvercle de base de la caméra, puis serrez les vis. 6. Fixez la caméra à l aide du fil de sécurité fourni. 7. Glissez les supports de rack de la caméra réseau dans les logements de la plaque de fixation, puis tournez la caméra. 8. Installez l injecteur High PoE à 1 port, reportez-vous à la section Installation de l injecteur High PoE AXIS T8123 à 1 port, page Vérifiez que les voyants lumineux sur l injecteur indiquent les conditions correctes. Pour plus d informations, reportez-vous au tableau à la page 43. Fixation au faux-plafond 1. Retirez la plaque de plafond sur laquelle le kit de montage doit être fixé. 2. Utilisez le modèle fourni pour marquer l emplacement du trou de 210 mm dans la plaque de plafond. Faites un trou suivant le contour du modèle. Plaque de plafond Diamètre du trou 210 mm Remarques : Le poids total de la caméra plus le kit de montage est environ 2,3 kg. Assurez-vous que le matériau du plafond est suffisamment solide pour supporter ce poids. L épaisseur de la plaque de plafond doit être entre 5 mm et 60 mm. 3. Assemblez le support pour installation au plafond. 4. Posez le support sur la plaque de plafond, voir l illustration à la page Serrez les vis du bras de support à l aide d un tournevis torx Desserrez les quatre vis du couvercle de base de la caméra, puis retirez le couvercle, voir l illustration à la page 25. 29 AXIS P5532/P5534 Guide d'installation Page Acheminez le câble réseau et le câble multi-connexion, le cas échéant, puis branchez-les à la caméra réseau. Veillez à ne pas endommager les câbles lors du branchement. Vérifiez que les trous sur le joint en mousse sont alignés aux passages pour câble et, le cas échéant, enlevez l échancrure du joint en mousse pour laisser passer le câble multi-connexion. Câble multi-connexion Câble réseau 8. Remettez en place le couvercle de base de la caméra, puis serrez les vis. 9. Fixez la caméra à l aide du fil de sécurité fourni. Plaque de plafond Fil de sécurité FRANÇAIS Support sur la plaque 10. Glissez les supports de rack de la caméra réseau dans les logements de la plaque de fixation, puis tournez la caméra. 11. Installez l injecteur High PoE à 1 port, reportez-vous à la section Installation de l injecteur High PoE AXIS T8123 à 1 port, page Vérifiez que les voyants lumineux sur l injecteur indiquent les conditions correctes. Pour plus d informations, reportez-vous au tableau de la page Installez la plaque de plafond (avec la caméra déjà montée) dans le plafond. 30 Page 30 AXIS P5532/P5534 Guide d'installation 14. Placez la brague décorative sur le support, puis mettez-le en position. Brague décorative Fixation du support (accessoire en option) 1. Installez le support choisi conformément aux instructions fournies avec le support. S il s avère nécessaire de percer, vérifiez que les forets, vis et chevilles à utiliser sont appropriés pour le matériau. 2. Desserrez les quatre vis du couvercle de base de la caméra, puis retirez le couvercle, voir l illustration à la page Acheminez le câble réseau et le câble multiconnexion, le cas échéant, dans les trous du support de fixation. 4. Accrochez la caméra au fil de sécurité du support. Fil de sécurité Support mural (exemple de fixation) Vis Torx T30 Logements pour supports de rack 5. Branchez le câble réseau et le câble multi-connexion, le cas échéant, à la caméra réseau. 6. Installez l injecteur AXIS T8123, reportez-vous à la section Installation de l injecteur High PoE AXIS T8123 à 1 port, page Remettez en place le couvercle de base de la caméra. 8. Glissez les supports de rack de la caméra réseau dans les logements du support, puis tournez la caméra. 9. Fixez la caméra réseau au support de fixation à l aide des trois vis (Torx T30). 31 AXIS P5532/P5534 Guide d'installation Page 31 Installation de l injecteur High PoE AXIS T8123 à 1 port L injecteur High PoE AXIS T8123 à 1 port permet aux produits de vidéo sur IP Axis consommant une quantité importante d énergie de recevoir des données et de l alimentation via le même câble Ethernet. Procédez comme suit pour brancher l injecteur AXIS T8123 : 1. Branchez l injecteur AXIS T8123 (Données d entrée) au commutateur réseau via un câble réseau standard. 2. Branchez l injecteur AXIS T8123 (Données et alimentation de sortie) à la caméra réseau, via un câble réseau déjà branché à la caméra. 3. Branchez l injecteur AXIS T8123 à une prise CA ( V CA), à l aide du câble d alimentation fourni. AXIS T8123 Indicateur de connexion de port Indicateur de connexion d entrée CA Données et alimentation de sortie Données d entrée Caméra réseau Ethernet FRANÇAIS Pour plus d informations sur les voyants lumineux de l injecteur, reportez-vous à la section Voyants d état AXIS T8123, page 43. 32 Page 32 AXIS P5532/P5534 Guide d'installation Attribution d une adresse IP Aujourd hui, la plupart des réseaux sont équipés d un serveur DHCP qui attribue automatiquement des adresses IP aux périphériques connectés. Si votre réseau ne possède pas de serveur DHCP, la caméra réseau utilise l adresse IP comme adresse IP par défaut. Si vous souhaitez paramétrer une adresse IP statique, sous Windows nous recommandons l utilisation de l application AXIS IP Utility ou de l application AXIS Camera Management. Selon le nombre de caméras à installer, utilisez la méthode qui vous convient le mieux. Ces deux applications gratuites sont disponibles sur le CD du produit de vidéo sur IP AXIS fourni avec ce produit. Vous pouvez également les télécharger à partir du site Méthode Recommandée pour Système d exploitation AXIS IP Utility Reportez-vous à la page 33 AXIS Camera Management Reportez-vous à la page 34 Une seule caméra Petites installations Plusieurs caméras Grandes installations Installation sur un autre sousréseau Windows Windows 2000 Windows XP Pro Windows 2003 Server Windows Vista Windows 7 Remarques : En cas d échec de l attribution d adresse IP, vérifiez qu aucun pare-feu ne bloque l opération. Pour connaître les autres méthodes d attribution ou de détection de l adresse IP, par exemple sous d autres systèmes d exploitation, reportez-vous à la page 38. 33 AXIS P5532/P5534 Guide d'installation Page 33 AXIS IP Utility : une seule caméra et une petite installation AXIS IP Utility détecte automatiquement les périphériques Axis de votre réseau et les affiche. Cette application sert également à attribuer manuellement une adresse IP statique. Notez que l ordinateur exécutant l application AXIS IP Utility doit se trouver sur le même segment de réseau (sous-réseau physique) que la caméra réseau. FRANÇAIS Recherche automatique 1. Vérifiez que la caméra réseau est connectée au réseau et qu elle se trouve sous tension. 2. Lancez AXIS IP Utility. 3. Lorsque l icône de la caméra apparaît dans la fenêtre, double-cliquez dessus pour ouvrir la page d accueil correspondante. 4. Reportez-vous à la page 35 pour savoir comment configurer le mot de passe. Attribution manuelle de l adresse IP (facultatif) 1. Trouvez une adresse IP inutilisée sur le même segment de réseau que celui de votre ordinateur. 2. Sélectionnez la caméra réseau dans la liste. 3. Cliquez sur le bouton Assign new IP address to the selected device (Attribuer une nouvelle adresse IP au périphérique sélectionné), puis saisissez l adresse IP. 4. Cliquez sur le bouton Assign (Attribuer) et suivez les instructions qui s affichent à l écran. La caméra doit être redémarrée dans les 2 minutes pour que la nouvelle adresse IP soit prise en compte. 5. Cliquez sur le bouton Home Page (Page d accueil) pour accéder aux pages Web de la caméra. 6. Reportez-vous à la page 35 pour savoir comment configurer le mot de passe. 34 Page 34 AXIS P5532/P5534 Guide d'installation AXIS Camera Management : plusieurs caméras et de grandes installations AXIS Camera Management peut détecter automatiquement plusieurs dispositifs Axis, afficher les états de connexion, gérer les mises à niveau du microprogramme et définir les adresses IP. Recherche automatique 1. Vérifiez que la caméra est connectée au réseau et sous tension. 2. Lancez AXIS Camera Management. Lorsque la caméra réseau apparaît dans la fenêtre, cliquez sur le lien avec le bouton droit de la souris, puis sélectionnez Live View Home Page (Page d accueil Vidéo en direct). 3. Reportez-vous à la page 35 pour savoir comment configurer le mot de passe. Attribution d une adresse IP à un seul périphérique 1. Sélectionnez la caméra réseau dans l application AXIS Camera Management, puis cliquez sur le bouton Assign IP (Attribuer une adresse IP). 2. Sélectionnez Assign the following IP address (Attribuer l adresse IP suivante) et saisissez l adresse IP, le masque de sous-réseau et le routeur par défaut que le périphérique utilisera. 3. Cliquez sur OK.
35 AXIS P5532/P5534 Guide d'installation Page 35 Attribution d adresses IP à plusieurs périphériques AXIS Camera Management accélère le processus d attribution d adresses IP à plusieurs périphériques en suggérant des adresses IP parmi une plage spécifiée. 1. Sélectionnez les périphériques à configurer (il peut s agir de plusieurs modèles), puis cliquez sur le bouton Assign IP (Attribuer une adresse IP). 2. Sélectionnez Assign the following IP address range (Attribuer la plage d adresses IP suivante) et saisissez la plage d adresses IP, le masque de sous-réseau et le routeur par défaut que les périphériques utiliseront. 3. Cliquez sur Update (Mettre à jour). Les adresses IP suggérées sont énumérées sous le champ New IP Addresses (Nouvelles adresses IP) et peuvent être modifiées en sélectionnant un périphérique et en cliquant sur le bouton Edit (Modifier). 4. Cliquez sur OK. FRANÇAIS Configuration du mot de passe Pour accéder au produit, le mot de passe par défaut de l administrateur, root, doit être configuré. Pour ce faire, utilisez la boîte de dialogue Configure Root Password (Configurer le mot de passe root) qui s affiche lors du premier accès à la caméra réseau. Pour éviter les écoutes électroniques lors de la configuration du mot de passe root, utilisez une connexion HTTPS cryptée nécessitant un certificat HTTPS. Remarque : Le protocole HTTPS (Hypertext Transfer Protocol over Secure Socket Layer) est utilisé pour crypter le trafic entre les navigateurs Web et les serveurs. Le certificat HTTPS contrôle l échange crypté des informations. Pour configurer le mot passe avec une connexion HTTP standard, saisissez directement le mot de passe dans la première boîte de dialogue représentée ci-dessous. Pour configurer le mot passe avec une connexion HTTPS cryptée, procédez comme suit : 1. Cliquez sur le bouton Create self-signed certificate (Créer un certificat autosigné). 2. Saisissez les informations demandées, puis cliquez sur OK. Le certificat est créé et le mot de passe peut maintenant être configuré en toute sécurité. Tout le trafic vers et depuis la caméra réseau est désormais crypté. 36 Page 36 AXIS P5532/P5534 Guide d'installation 3. Saisissez un mot de passe, puis saisissez-le de nouveau pour confirmation. Cliquez sur OK. Le mot de passe est maintenant configuré. Pour créer une connexion HTTPS, cliquez sur ce bouton. Pour configurer directement le mot de passe via une connexion cryptée, saisissez le mot de passe à cet endroit. 4. Pour vous connecter, saisissez le nom d utilisateur «root» dans la boîte de dialogue à l invite. Remarque : Le nom d utilisateur par défaut de l administrateur est root et il ne peut pas être supprimé. 5. Saisissez le mot de passe configuré ci-dessus et cliquez sur OK. Remarque : Si vous avez oublié votre mot de passe, vous devrez rétablir les paramètres d usine par défaut de votre caméra. Reportez-vous à la page 43. 38 Page 38 AXIS P5532/P5534 Guide d'installation Autres méthodes de configuration de l adresse IP Le tableau ci-dessous indique les autres méthodes permettant de configurer ou de déterminer l adresse IP. Toutes les méthodes sont activées par défaut et peuvent être désactivées. Utilisation sous le système d exploitation Remarques AVHS Service Connection Tous Permet de connecter la caméra à un service AVHS. Consultez le guide d installation du fournisseur de service. Pour plus d informations et pour rechercher un fournisseur de service AVHS local, visitez le site UPnP Windows Lorsque la caméra est activée sur votre ordinateur, elle est détectée automatiquement et vient s ajouter au dossier Favoris réseau. Bonjour AXIS Dynamic DNS Service MAC OS X (10.4 ou version ultérieure) Tous Pour les navigateurs compatibles avec Bonjour : Accédez au signet de Bonjour dans votre navigateur (par exemple Safari), puis cliquez sur le lien permettant d accéder aux pages Web de la caméra. Service Axis gratuit vous permettant d installer rapidement et facilement votre caméra. Nécessite une connexion Internet sans proxy HTTP. Pour plus d informations, visitez le site ARP/Ping Tous Reportez-vous aux instructions ci-dessous. La commande doit être saisie dans les deux minutes suivant la mise sous tension de la caméra. DHCP Tous Pour consulter les pages administratives du serveur DHCP réseau, reportez-vous à la documentation du serveur. 41 AXIS P5532/P5534 Guide d'installation Page 41 Câble multi-connexion (non fourni) Lors de la connexion d un équipement externe à l injecteur AXIS P5532/P5534, un câble multiconnexion est requis afin de maintenir la classification IP51 de la caméra. Le câble multi-connexion est disponible auprès de votre revendeur Axis. Branchez le câble multi-connexion au port multi-connexion, voir l illustration à la page 25 et les instructions à la page 27 et à la page 28. Les connecteurs que comprend le câble sont les suivants : Connecteur d alimentation : bloc terminal à trois broches utilisé pour la puissance d entrée. Alimentation en CC, V CC AXIS P5532 : max 15 W AXIS P5534 : max 17 W Alimentation en CA, V CA AXIS P5532 : max 20 VA AXIS P5534 : max 23,6 VA FRANÇAIS Entrée audio (rose) : entrée de 3,5 mm pour microphone mono ou signal d entrée mono (le canal de gauche est utilisé pour le signal stéréo). Sortie audio (vert) : sortie de 3,5 mm pour audio (niveau de ligne) qui peut être connectée à un système d annonce publique (PA) ou haut-parleur actif avec amplificateur intégré. Une paire d écouteurs peut être connectée également. Un connecteur stéréo doit être utilisé pour la sortie audio. Connecteur pour terminaux d E/S : utilisé dans le cadre d applications telles que la détection de mouvement, le déclenchement d événements, l enregistrement à intervalles et les notifications d alarme. En plus d une alimentation auxiliaire et d une broche de terre, le connecteur pour terminaux d E/S possède 4 broches qui peuvent être configurées comme entrées ou sorties. Ces broches assurent l interface avec : Sortie numérique : permet de connecter des dispositifs externes, comme des relais ou des voyants lumineux. Les dispositifs connectés peuvent être activés à l aide de l interface de programmation VAPIX, des boutons de sortie sur la page Live View (Vidéo en direct) ou à l aide d un type d événement. La sortie est considérée comme étant active (ce qui est visible dans Events > Port Status (Événements - État du port) si le dispositif d alarme est activé. 44 Page 44 AXIS P5532/P5534 Guide d'installation Accès à la caméra via Internet Une fois installée, votre caméra réseau est accessible sur votre réseau local (LAN). Pour accéder à la caméra via Internet, les routeurs réseau doivent être configurés pour autoriser le trafic entrant, ce qui est généralement réalisé sur un port spécifique. Le port HTTP (port 80 par défaut) pour l affichage et la configuration Le port RTSP (port 554 par défaut) pour l affichage des flux de données vidéo H.264 Pour plus d informations, consultez la documentation du routeur. Pour plus d informations à ce sujet ou pour toute autre question, consultez la page Assistance technique du site Web d Axis à l adresse Plus d informations Le manuel de l utilisateur est disponible sur le site Web d Axis ( et sur le CD du produit de vidéo sur IP AXIS fourni avec le produit. Conseil : Visitez le site pour vérifier si des micrologiciels mis à jour sont disponibles pour votre caméra réseau. Pour connaître la version du micrologiciel actuellement installée, reportez-vous à la page Setup > About (Configuration - À propos de). 48 Seite 48 AXIS P5532/P5534 Installationsanleitung Installieren der Hardware! WICHTIG! - Um die AXIS P5532/P5534 im Freien zu verwenden, muss sie in einem zugelassenen Außengehäuse installiert werden. Auf unserer Homepage unter finden Sie weitere Informationen über Außengehäuse. Vorbereitung der Installation Lesen Sie zunächst alle Anweisungen, bevor Sie mit der Installationsvorbereitung der AXIS P5532/ P5534 beginnen. Bei einigen Vorbereitungsschritten muss die obere Abdeckung abgenommen werden, sodass es sinnvoll ist, diese Schritte zusammen durchzuführen. Führen Sie die unter Entfernen der Schutzfolien beschriebenen Schritte zur Entfernung der Schutzfolien aus, bevor Sie mit der Installation der Kamera beginnen. Im Lieferumfang der Kamera ist eine transparente Abdeckung in Klarglas und in Rauchglas enthalten. Führen Sie bei Bedarf die Anweisungen unter Austauschen der klaren/getönten Kuppelabdeckung (optional) aus, um die Kuppelabdeckung auszutauschen. Wenn Sie Bilder lokal in der Netzwerk-Kamera speichern möchten, benötigen Sie eine SD- Speicherkarte mit normaler oder hoher Kapazität (separat erhältlich). Führen Sie die unter Installation einer SD-Speicherkarte (optional) beschriebenen Schritte aus, um die obere Abdeckung zu entfernen und eine SD-Speicherkarte zu installieren. Entfernen der Schutzfolien 1. Lösen Sie die vier Schrauben der oberen Abdeckung und nehmen Sie die Abdeckung ab. Siehe Abbildung auf Seite Entfernen Sie die Schutzfolien. Schutsfolien 3. Wenn Sie die klare bzw. getönte Kuppelabdeckung austauschen oder eine SD-Speicherkarte installieren möchten, führen Sie die Anweisungen unter Austauschen der klaren/getönten Kuppelabdeckung (optional) bzw. unter Installation einer SD-Speicherkarte (optional) aus. 4. Bringen Sie die obere Abdeckung wieder an der ursprünglichen Position an und ziehen Sie die Schrauben fest. 49 AXIS P5532/P5534 Installationsanleitung Seite 49 Austauschen der klaren/getönten Kuppelabdeckung (optional) 1. Lösen Sie die vier Schrauben der oberen Abdeckung und nehmen Sie die Abdeckung ab. Siehe Abbildung auf Seite Lösen Sie die 6 Schrauben des Kuppelrings und entfernen Sie den Kuppelrung von der oberen Abdeckung. 3. Bringen Sie den Kuppelring und die Kuppelabdeckung an der oberen Abdeckung an und befestigen Sie diese, indem Sie die sechs Schrauben anziehen. 4. Zur Installation einer SD-Speicherkarte führen Sie die unter Installation einer SD-Speicherkarte (optional) beschriebenen Schritte aus. 5. Bringen Sie die obere Abdeckung wieder an der ursprünglichen Position an und ziehen Sie die Schrauben fest. Hinweis: Achten Sie darauf, die Kuppelabdeckung nicht zu zerkratzen oder zu beschädigen. Säubern Sie die Kuppelabdeckung mit einem weichen Tuch, bevor Sie sie an der Kameraeinheit anbringen. Installation einer SD-Speicherkarte (optional) 1. Lösen Sie die vier Schrauben der oberen Abdeckung und nehmen Sie die Abdeckung ab. Siehe Abbildung auf Seite Schieben Sie eine SD-Speicherkarte (separat erhältlich) in den SDHC-Speicherkartenschacht. 3. Bringen Sie die obere Abdeckung wieder an der ursprünglichen Position an und ziehen Sie die Schrauben fest. DEUTSCH Hinweis: Die SD-Speicherkarte wird automatisch aktiviert, wenn Sie sie in den SDHC- Speicherkarteneinschub einsetzen. Bevor Sie die SD-Speicherkarte entfernen, müssen Sie sie über die Webseiten der Kamera deaktivieren. Wählen Sie hierzu Setup > System Options > Storage > SD Card (Setup > Systemoptionen > Speicher > SD-Speicherkarte) und klicken Sie auf Unmount (Deaktivieren). Weitere Informationen hierzu finden Sie im Benutzerhandbuch, das sich auf der mitgelieferten CD für Axis-Netzwerkvideoprodukte befindet und auf der Website unter erhältlich ist. 50 Seite 50 AXIS P5532/P5534 Installationsanleitung Deckenmontage 1. Bereiten Sie die Befestigung der Montageplatte an der Decke vor. Markieren Sie die Position der Bohrlöcher mithilfe der mitgelieferten Bohrschablone. Stellen Sie sicher, dass die Bohrerspitzen, Schrauben und Dübel für den Baustoff der Decke geeignet sind. 2. Bringen Sie die Montageplatte an der Decke an. Montageplatte Sicherheitsdraht 3. Lösen Sie die vier Schrauben der Kameragrundplatte und nehmen Sie die Grundplatte ab. Siehe Abbildung auf Seite Verbinden Sie das Netzwerkkabel und bei Bedarf das Mehrfachanschlusskabel mit der Netzwerk-Kamera. Achten Sie darauf, die Kabel beim Anschließen nicht zu beschädigen. Vergewissern Sie sich, dass die Schaumstofflöcher auf die Kabelführungen ausgerichtet sind und entfernen Sie ggf. das herausnehmbare Teil für das Mehrfachanschlusskabel aus der Schaumstoffdichtung. 5. Bringen Sie die Kameragrundplatte wieder an der ursprünglichen Position an und ziehen Sie die Schrauben fest. 6. Sichern Sie die Kamera mit dem mitgelieferten Sicherheitsdraht. 7. Schieben Sie die Kamerabefestigungen an der Netzwerk-Kamera in die Aussparungen in der Montageplatte und drehen Sie die Kameraeinheit. 8. Installieren Sie den High PoE Midspan (1 Anschluss), siehe Installation des AXIS T8123 High PoE Midspan (1 Anschluss), auf Seite Überprüfen Sie, ob die LED-Anzeigen die Betriebszustände korrekt angeben. Weitere Informationen hierzu finden Sie in der Tabelle auf Seite 66. 51 AXIS P5532/P5534 Installationsanleitung Seite 51 Hängedeckenmontage 1. Nehmen Sie die Deckenplatte ab, in der die Halterung für Hängedecken angebracht werden soll. 2. Markieren Sie mithilfe der mitgelieferten Schablone die Position des 210-mm-Lochs in der Deckenplatte. Schneiden Sie das Loch entlang der Schablone aus. Deckenplatte Lochdurchmesser 210-mm Hinweise: Das Gesamtgewicht von Kamera und Deckenhalterung beträgt etwa 2,3 kg. Vergewissern Sie sich, dass das Deckenmaterial stabil genug ist, um dieses Gewicht zu tragen. Die Stärke der Deckplatte sollte 5 mm bis 60 mm betragen. 3. Setzen Sie die Deckenhalterung zusammen. 4. Bringen Sie die Deckenhalterung in der Deckenplatte an. Siehe Abbildung auf Seite Ziehen Sie die Schrauben des Halterungsarms mit einem Torx-Schraubenzieher für Torx 20- Schrauben fest. 6. Lösen Sie die vier Schrauben der Kameragrundplatte und nehmen Sie die Grundplatte ab. Siehe Abbildung auf Seite Verbinden Sie das Netzwerkkabel und bei Bedarf das Mehrfachanschlusskabel mit der Netzwerk-Kamera. Achten Sie darauf, die Kabel beim Anschließen nicht zu beschädigen. Vergewissern Sie sich, dass die Schaumstofflöcher auf die Kabelführungen ausgerichtet sind und entfernen Sie ggf. das herausnehmbare Teil für das Mehrfachanschlusskabel aus der Schaumstoffdichtung. DEUTSCH Mehrfachanschlusskabel Netzwerkkabel 8. Bringen Sie die Kameragrundplatte wieder an der ursprünglichen Position an und ziehen Sie die Schrauben fest. 54 Seite 54 AXIS P5532/P5534 Installationsanleitung Installation des AXIS T8123 High PoE Midspan (1 Anschluss) Mit dem AXIS T8123 High PoE Midspan (1 Anschluss) können Netzwerk-Videoprodukte von Axis mit einem großen Stromverbrauch über dasselbe Ethernet-Kabel sowohl mit Daten als auch mit Strom versorgt werden. Führen Sie zum Verbinden des AXIS T8123 die folgenden Schritte aus. 1. Verbinden Sie den AXIS T8123 (Dateneingang) über ein Standard-Netzwerkkabel mit dem Netzwerk-Switch. 2. Verbinden Sie den AXIS T8123 (Daten- und Stromausgang) über das zuvor an die Kamera angeschlossene Netzwerkkabel mit der Netzwerk-Kamera. 3. Schließen Sie den AXIS T8123 über das mitgelieferte Netzkabel an eine Netzsteckdose (100 bis 240 V Wechselstrom) an. AXIS T8123 Netzeingangsverbindungsanzeige Port verbindungsanzeige Daten- und Stromausgang Dateneingang Netzwerk-Kamera Ethernet Informationen zu den LEDs auf dem Midspan finden Sie unter AXIS T8123 Statusanzeigen, auf Seite 66. 56 Seite 56 AXIS P5532/P5534 Installationsanleitung AXIS IP Utility - einzelne Kamera/kleine Installation AXIS IP Utility erkennt automatisch die im Netzwerk vorhandenen Axis-Geräte und zeigt diese an. Die Anwendung kann außerdem zur manuellen Zuweisung einer statischen IP-Adresse verwendet werden. Beachten Sie, dass sich der Computer, auf dem AXIS IP Utility ausgeführt wird, und die Netzwerk- Kamera in demselben Netzwerksegment (physischen Subnetz) befinden müssen. Automatische Erkennung 1. Stellen Sie sicher, dass die Netzwerk-Kamera an das Netzwerk und an die Stromversorgung angeschlossen ist. 2. Starten Sie AXIS IP Utility. 3. Doppelklicken Sie auf das Symbol der Kamera, um die entsprechende Startseite zu öffnen. 4. Anweisungen zum Festlegen des Kennworts finden Sie auf Seite 58. Manuelle Zuweisung der IP-Adresse (optional) 1. Wählen Sie eine nicht zugewiesene IP-Adresse im selben Netzwerksegment, in dem sich Ihr Computer befindet. 2. Wählen Sie die Netzwerk-Kamera in der Liste aus. 3. Klicken Sie auf die Schaltfläche Assign new IP address to the selected device button (Zuweisung einer neuen IP-Adresse an das ausgewählte Gerät) und geben Sie die IP Adresse ein. 4. Klicken Sie auf die Schaltfläche Assign (Zuweisen) und befolgen Sie die angezeigten Anweisungen. Beachten Sie, dass die Kamera innerhalb von 2 Minuten neu gestartet werden muss, um die neue IP-Adresse festzulegen. 5. Klicken Sie auf die Schaltfläche Home Page (Startseite), um auf die Webseiten der Kamera zuzugreifen. 6. Anweisungen zum Festlegen des Kennworts finden Sie auf Seite 58. 57 AXIS P5532/P5534 Installationsanleitung Seite 57 AXIS Camera Management - mehrere Kameras/große Installationen Mit AXIS Camera Management können automatisch mehrere Axis-Geräte erkannt, der Verbindungsstatus angezeigt, die Firmware-Aktualisierungen verwaltet und IP-Adressen festgelegt werden. Automatische Erkennung 1. Stellen Sie sicher, dass die Kamera an das Netzwerk und die Stromversorgung angeschlossen ist. 2. Starten Sie AXIS Camera Management. Wenn die Netzwerk-Kamera im Fenster angezeigt wird, klicken Sie mit der rechten Maustaste darauf und wählen Sie Live View Home Page (Homepage der Live-Ansicht). 3. Anweisungen zum Festlegen des Kennworts finden Sie auf Seite 58. DEUTSCH Zuweisen einer IP-Adresse für ein einzelnes Gerät 1. Wählen Sie in AXIS Camera Management die Netzwerk- Kamera aus und klicken Sie auf die Schaltfläche Assign IP (IP- Adresse zuweisen). 2. Wählen Sie die Option Assign the following IP address (Folgende IP-Adresse zuweisen) und geben Sie die IP-Adresse, die Subnetzmaske und den Standardrouter für das Gerät ein. 3. Klicken Sie auf OK.
58 Seite 58 AXIS P5532/P5534 Installationsanleitung Zuweisen von IP-Adressen für mehrere Geräte AXIS Camera Management beschleunigt die Zuweisung von IP- Adressen an mehrere Geräte, indem IP-Adressen aus einem angegebenen Bereich vorgeschlagen werden. 1. Wählen Sie die zu konfigurierenden Geräte aus (es können auch unterschiedliche Modelle gewählt werden) und klicken Sie auf die Schaltfläche Assign IP (IP-Adresse zuweisen). 2. Wählen Sie die Option Assign the following IP address range (Folgenden IP-Adressbereich zuweisen) und geben Sie den IP-Adressbereich, die Subnetzmaske und den Standardrouter für die Geräte ein. 3. Klicken Sie auf Update (Aktualisieren). Die vorgeschlagenen IP-Adressen werden in der Liste New IP Addresses (Neue IP-Adressen) aufgeführt. Wenn Sie eine IP-Adresse ändern möchten, wählen Sie das Gerät aus und klicken Sie auf die Schaltfläche Edit (Bearbeiten). 4. Klicken Sie auf OK. Festlegen des Kennworts Für den Zugriff auf das Produkt muss das Kennwort für den standardmäßigen Administrator- Benutzer root festgelegt werden. Beim erstmaligen Zugriff auf die Netzwerk-Kamera wird das Dialogfeld Configure Root Password (Root-Kennwort konfigurieren) angezeigt. Dort kann das Kennwort festgelegt werden. Um ein Abhören der Netzwerkkommunikation während der Festlegung des Root-Kennworts zu vermeiden, können Sie diesen Vorgang über eine verschlüsselte HTTPS-Verbindung durchführen, die ein HTTPS-Zertifikat erfordert. Hinweis: Das Protokoll HTTPS (Hypertext Transfer Protocol over SSL) wird verwendet, um den Datenverkehr zwischen Webbrowsern und Servern zu verschlüsseln. Das HTTPS- Zertifikat steuert den verschlüsselten Informationsaustausch. Zum Festlegen des Kennworts über eine standardmäßige HTTP-Verbindung geben Sie es direkt in das erste unten abgebildete Dialogfeld ein. Um das Kennwort über eine verschlüsselte HTTPS-Verbindung festzulegen, führen Sie die folgenden Schritte aus: 1. Klicken Sie auf die Schaltfläche Create self-signed certificate (Selbstsigniertes Zertifikat erstellen). 2. Geben Sie die angeforderten Informationen ein und klicken Sie auf OK. Das Zertifikat wird erstellt, und das Kennwort kann jetzt sicher festgelegt werden. Der gesamte Datenverkehr der Netzwerk-Kamera wird ab diesem Zeitpunkt verschlüsselt. 59 AXIS P5532/P5534 Installationsanleitung Seite Geben Sie ein Kennwort ein, und wiederholen Sie die Eingabe, um die korrekte Schreibweise zu bestätigen. Klicken Sie auf OK. Damit ist das Kennwort konfiguriert. Klicken Sie zum Herstellen einer HTTPS-Verbindung zunächst auf diese Schaltfläche. Um das Kennwort direkt über eine unverschlüsselte Verbindung zu konfigurieren, geben Sie es hier ein. 4. Geben Sie den Benutzernamen root wie erforderlich ein. Hinweis: Der standardmäßige Administrator-Benutzername root kann nicht gelöscht werden. DEUTSCH 5. Geben Sie das zuvor festgelegte Kennwort ein und klicken Sie auf OK. Hinweis: Wenn Sie das Kennwort vergessen haben, muss die Kamera auf die Werkseinstellungen zurückgesetzt werden. Siehe Seite 66. 60 Seite 60 AXIS P5532/P5534 Installationsanleitung Zugriff auf den Videostrom Die Seite Live View (Live-Ansicht) der Netzwerk-Kamera wird geöffnet. Sie enthält Links zu Setup- Tools, mit denen Sie die Kamera Ihren Bedürfnissen entsprechend anpassen können. Klicken Sie bei Bedarf auf Yes (Ja), um AMC (AXIS Media Control) zu installieren. Nach Abschluss der Installation können Sie Videoströme in Internet Explorer anzeigen. Hierzu müssen Sie über Administratorrechte für den Computer verfügen. Falls nötig, klicken Sie auf den Link, um fehlende Decoder zu installieren. Hinweis: Für die Installation von AMC unter Windows 7/Windows Vista müssen Sie Internet Explorer als Administrator ausführen. Klicken Sie mit der rechten Maustaste auf das Internet Explorer-Symbol und wählen Sie Als Administrator ausführen. Setup: Alle zur benutzerspezifischen Konfiguration der Kamera notwendigen Werkzeuge. Hilfe: Zum Aufrufen der Online-Hilfe für die Kamera. 62 Seite 62 AXIS P5532/P5534 Installationsanleitung Zuweisen der IP-Adresse per ARP/Ping 1. Wählen Sie eine IP-Adresse aus dem Netzwerksegment, in dem sich auch Ihr Computer befindet. 2. Suchen Sie die Seriennummer (S/N) auf dem Produktaufkleber an der Kamera. 3. Öffnen Sie auf Ihrem Computer die Eingabeaufforderung, und geben Sie die folgenden Befehle ein: Windows-Syntax: arp -s <IP-Adresse> <Seriennummer> ping -l 408 -t <IP-Adresse> Syntax unter UNIX/Linux/Mac: arp -s <IP-Adresse> <Seriennummer> temp ping -s 408 <IP-Adresse> Beispiel für Windows: arp -s c ping -l 408 -t Beispiel für UNIX/Linux/Mac: arp -s :40:8c:18:10:00 temp ping -s Stellen Sie sicher, dass das Netzwerkkabel mit der Kamera verbunden ist und starten Sie die Kamera bzw. starten Sie diese neu, indem Sie die Stromversorgung unterbrechen und wiederherstellen. 5. Schließen Sie die Befehlszeile, sobald Reply from :... oder eine ähnliche Meldung erscheint. 6. Starten Sie einen Browser, geben Sie im Adressfeld ein und drücken Sie die Eingabetaste auf der Tastatur. Hinweise: So öffnen Sie die Eingabeaufforderung unter Windows: Wählen Sie im Startmenü die Option Ausführen... und geben Sie cmd ein. Klicken Sie auf OK. Klicken Sie zum Eingeben des Befehls ARP unter Windows 7/Windows Vista mit der rechten Maustaste auf das Befehlszeilensymbol und wählen Sie Als Administrator ausführen. Verwenden Sie zum Eingeben des Befehls ARP unter Mac OS X das Dienstprogramm Terminal, das Sie unter Anwendung > Dienstprogramme finden. 64 Seite 64 AXIS P5532/P5534 Installationsanleitung Mehrfachanschlusskabel (separat erhältlich) Wenn Sie externe Geräte an die AXIS P5532/P5534 anschließen, benötigen Sie ein Mehrfachanschlusskabel, damit der IP51-Schutz erhalten bleibt. Das Mehrfachanschlusskabel können Sie von Ihrem Axis-Händler erwerben. Schließen Sie das Mehrfachanschlusskabel an den Mehrfachanschluss der Kamera an, siehe die Abbildung auf Seite 47 und die Anweisungen auf Seite 50 und Seite 51. Das Kabel verfügt über die folgenden Anschlüsse: Netzanschluss - 3-poliger Anschlussblock für Netzeingang. Gleichstromeingang V Gleichstrom AXIS P5532: max. 15 W AXIS P5534: max. 17 W Wechselstromeingang V Wechselstrom AXIS P5532: max 20 VA AXIS P5534: max. 23,6 VA Audioeingang (rosa) - 3,5-mm-Anschluss für ein Monomikrofon oder ein Monosignal (linker Kanal wird von einem Stereosignal benutzt). Audioausgang (grün) - 3,5-mm-Audio-Ausgang (Leistungsstufe) zum Anschließen einer Rundrufanlage (PA) oder eines Aktivlautsprechers mit integriertem Verstärker. Auch ein Kopfhörer kann angeschlossen werden. Für den Audioausgang muss ein Stereostecker benutzt werden. E/A-Anschluss - Wird z. B. für Bewegungserkennung, Ereignisauslösung, Zeitrafferaufnahmen, Alarmbenachrichtigungen usw. verwendet. Außer den Kontakten für eine Zusatzstromversorgung und Masse verfügt der E/A-Anschluss noch über 4 weitere Kontakte, die entweder als Eingang oder als Ausgang konfiguriert werden können. Diese Kontakte stellen die Schnittstelle für Folgendes bereit: Digitalausgang: Zum Anschluss externer Geräte wie Relais und LEDs. Angeschlossene Geräte können über die VAPIX API (Application Programming Interface), über die Ausgabeschaltflächen auf der Seite Live View (Live-Ansicht) oder durch einen Ereignistyp aktiviert werden. Der Ausgang wird als aktiv [siehe Events > Port Status (Ereignisse > Port- Status)] angezeigt, wenn die Alarmvorrichtung eingeschaltet ist. 65 AXIS P5532/P5534 Installationsanleitung Seite 65 Digitaler Eingang - Alarmeingang für den Anschluss von Geräten, die zwischen geöffnetem und geschlossenem Schaltkreis wechseln können, z. B.: PIR-Kameras, Tür/Fensterkontakte, Glasbruchmelder usw. Bei Empfang eines Signals ändert sich der Status und der Eingang wird aktiviert [siehe Events > Port Status (Ereignisse > Port-Status)]. Funktion Anschluss Hinweise Spezifikationen ERDE 1 Masse 3.3 V Gleichstrom 2 Dieser Kontakt kann auch für die Stromversorgung von Zusatzgeräten verwendet werden. Hinweis: Dieser Anschluss kann nur für die Stromversorgung verwendet werden. Konfigurierbar (Ein- oder Ausgang) 3-6 Digitaleingang: Zum Aktivieren mit dem Massekontakt verbinden; zum Deaktivieren nicht anschließen. Digitalausgang: Verwendet einen NFET-Transistor mit offener Senke, wobei die Quelle mit der Masse verbunden ist. Zum Schutz vor Spannungsspitzen muss bei der Kombination mit einem externen Relais eine Diode parallel zur Last geschaltet werden. Max. Stromstärke = 250 ma Min. Eingang = -40 V Gleichstrom Max. Eingang = +40 V Gleichstrom Max. Stromstärke = 100 ma Max. Spannung = +40 V Gleichstrom DEUTSCH AXIS P5532/P5534 Statusanzeigen Farbe Leuchtet nicht Gelb Gelb/rot Rot Grün Bedeutung Konstante Verbindung/Normalbetrieb Leuchtet konstant bei der Systeminitialisierung und beim Zurücksetzen auf die Werkseinstellungen. Blinkt bei der Firmware-Aktualisierung. Keine Netzwerkverbindung vorhanden Firmware-Aktualisierung fehlgeschlagen Konstant für 10 Sek. nach erfolgreichem Neustart Hinweis: Weitere Informationen zu den AXIS P5532/P5534 Statusanzeigen finden Sie im Benutzerhandbuch, das sich auf der mitgelieferten CD für Axis- Netzwerkvideoprodukte befindet und auf der Website unter erhältlich ist. 66 Seite 66 AXIS P5532/P5534 Installationsanleitung AXIS T8123 Statusanzeigen LED Farbe Bedeutung Port Leuchtet nicht Keine Kamera angeschlossen Blinkt Stromüberlast oder anderer Fehler bei der Eingangsspannung Grün Kamera verbunden, normales Verhalten Netzeingang Konstant grün Netzstrom verbunden Wiederherstellen der werkseitigen Standardeinstellungen Wenn Sie die Kamera auf die Werkseinstellungen zurücksetzen möchten, drücken Sie die Steuertaste und die Neustarttaste an der Seite der Kamera (siehe Hardwareübersicht, auf Seite 46) wie im Folgenden beschrieben: So setzen Sie mithilfe der Steuer- und der Neustarttaste sämtliche Parameter einschließlich der IP- Adresse auf die werkseitigen Standardeinstellungen zurück: 1. Nehmen Sie die obere Abdeckung ab, siehe Entfernen der Schutzfolien, auf Seite Drücken Sie gleichzeitig die Steuer- und die Neustarttaste und halten Sie die Tasten gedrückt. 3. Lassen Sie die Neustarttaste los und halten Sie die Steuertaste weiterhin gedrückt. 4. Halten Sie die Steuertaste gedrückt, bis die Statusanzeige gelb leuchtet (dies kann bis zu 15 Sekunden dauern). 5. Lassen Sie die Steuertaste los. 6. Wenn die Statusanzeige grün wird (was bis zu einer Minute lang dauern kann), ist der Vorgang abgeschlossen, und die Kamera wurde zurückgesetzt. Die Kamera hat jetzt die Standard-IP- Adresse Bringen Sie die obere Abdeckung wieder an der ursprünglichen Position an. 8. Legen Sie die IP-Adresse erneut fest. Wenden Sie dabei eines der unter Zuweisen einer IP- Adresse, auf Seite 55 beschriebenen Verfahren an. Die Parameter können auch über die Weboberfläche auf die werkseitigen Einstellungen zurückgesetzt werden. Weitere Informationen hierzu finden Sie in der Online-Hilfe und im Benutzerhandbuch auf der mitgelieferten CD für Axis-Netzwerkvideoprodukte. 72 Pagina 72 Guida all'installazione AXIS P5532/P5534 Installazione dell'hardware! IMPORTANTE! - Per utilizzare la telecamera AXIS P5532/P5534 all'esterno, è necessario installarla in un alloggiamento per esterni approvato. Per ulteriori informazioni sulle custodie per esterni, visitare il sito Preparazione dell'installazione Leggere tutte le istruzioni prima di installare l'unità AXIS P5532/P5534 poichè numerose fasi di preparazione dell'istallazione richiedono la rimozione del coperchio superiore ed è opportuno che vengano completate nello stesso momento. Seguire le istruzioni in Rimuovere l'imballo protettivo, più avanti, per rimuovere l'imballo protettivo prima di installare l'unità. La telecamera viene fornita con una copertura trasparente chiara e una copertura trasparente oscurata. Se necessario, seguire le istruzioni in Sostituire la copertura a cupola trasparente/oscurata (facoltativo), più avanti, per sostituire la copertura a cupola. Per memorizzare localmente le immagini riprese dalla macchina fotografica di rete, è necessaria una scheda SD (non inclusa) con capacità standard o elevata. Seguire le istruzioni in Installazione di una scheda SD (facoltativa), più avanti, per rimuovere la copertura superiore prima di installare una scheda SD. Rimuovere l'imballo protettivo 1. Allentare le 4 viti della copertura superiore e rimuoverla, come nell'illustrazione a pagina Rimuovere l'imballo protettivo. Imballo protettivo 3. Se si deve sostituire la copertura a cupola chiara/oscurata o installare una scheda SD, fare riferimento alle istruzioni in Sostituire la copertura a cupola trasparente/oscurata (facoltativo) e Installazione di una scheda SD (facoltativa), più avanti. 4. Rimontare la copertura superiore nella posizione originale e stringere le viti. 74 Pagina 74 Guida all'installazione AXIS P5532/P Controllare che i LED di segnalazione del midspan indichino le condizioni corrette e consultare la tabella a pagina 87 per ulteriori dettagli. Montaggio su soffitto mobile 1. Rimuovere il pannello del soffitto su cui deve essere eseguito il montaggio. 2. Utilizzare la maschera fornita per contrassegnare la posizione del foro da 210 mm nel pannello del soffitto. Tagliare lungo la maschera. Pannello del soffitto Diametro del foro 210 mm Note: Il peso totale della telecamera e degli accessori per il montaggio a soffitto è di circa 2,3 kg. Controllare che il materiale del soffitto sia sufficientemente robusto per sostenere tale peso. Il pannello del soffitto dovrebbe essere spesso da 5 mm a 60 mm. 3. Montare la staffa per il montaggio a soffitto. 4. Inserire la staffa per il soffitto nel pannello, come nell'illustrazione a pagina Stringere le viti del braccio della staffa usando un cacciavite torx Allentare le 4 viti del coperchio della base della telecamera e rimuoverlo, come nell'illustrazione a pagina Stendere e collegare alla telecamera il cavo di rete e il cavo multiplo, se applicabile. Fare attenzione a non danneggiare i cavi mentre se ne esegue la connessione. Assicurarsi che i fori della guarnizione di spugna siano allineati con i passaggi dei cavi e, se necessario, rimuovere dalla guarnizione di spugna il pezzo pretagliato per il cavo multiplo. Cavo multiplo Cavo di rete 8. Rimontare il coperchio della base della telecamera nella posizione originale e stringere le viti. 76 Pagina 76 Guida all'installazione AXIS P5532/P5534 Montaggio su staffa (accessorio opzionale) 1. Installare la staffa selezionata secondo le istruzioni fornite con la staffa. Se è necessario forare, assicurarsi di utilizzare punte, viti e tasselli adatti al materiale. 2. Allentare le 4 viti del coperchio della base della telecamera e rimuoverlo, come nell'illustrazione a pagina Stendere il cavo di rete e il cavo multiplo, se applicabile, attraverso i fori della staffa a parete. 4. Agganciare la telecamera al cavo di sicurezza della staffa. 5. Collegare alla telecamera il cavo di rete e il cavo multiplo, se applicabile. 6. Installare l'unità AXIS T8123, vedere Installare il Midspan AXIS T8123 High PoE a 1 porta, a pagina Rimontare il coperchio della base della telecamera nella posizione originale. 8. Far scorrere i supporti della telecamera di rete nelle scanalature della staffa e ruotare la telecamera. 9. Fissare la telecamera di rete alla staffa di montaggio stringendo le 3 viti (Torx T30). Installare il Midspan AXIS T8123 High PoE a 1 porta Viti Torx T30 Cavo Fessure per di sicurezza i supporti dell'unità Staffa di montaggio a muro (esempio di montaggio) Il Midspan T8123 High PoE a 1 porta consente di alimentare e trasmettere dati ai prodotti video di rete Axis che consumano molta energia, utilizzando un unico cavo Ethernet. Seguire queste istruzioni per connettere l'unità AXIS T Collegare l'unità AXIS T8123 (ingresso dati) allo switch di rete utilizzando un cavo di rete standard. 2. Collegare l'unità AXIS T8123 (uscita dati e alimentazione) alla telecamera di rete, utilizzando il cavo di rete già connesso alla telecamera. 3. Collegare l'unità AXIS T8123 a una presa CA ( V CA) utilizzando il cavo di alimentazione fornito. AXIS T8123 Indicatore di connettività della porta Dati e alimentazione Ingresso dati Indicatore di connettività dell'ingresso CA Telecamera di rete Ethernet Per informazioni sui LED del midspan, vedere Indicatori di stato AXIS T8123, a pagina 87. 78 Pagina 78 Guida all'installazione AXIS P5532/P5534 AXIS IP Utility: telecamera singola/piccole installazioni AXIS IP Utility rileva e visualizza automaticamente i dispositivi Axis collegati alla rete. L applicazione inoltre può essere utilizzata per assegnare manualmente un indirizzo IP statico. Si tenga presente che la telecamera di rete deve essere installata sullo stesso segmento di rete (subnet fisica) del computer sul quale è in esecuzione AXIS IP Utility. Rilevamento automatico 1. Verificare che la telecamera di rete sia collegata alla rete e alimentata correttamente. 2. Avviare AXIS IP Utility. 3. Quando la telecamera viene visualizzata nella finestra, selezionarla con un doppio clic per aprire la home page. 4. Vedere a pagina 80 per istruzioni su come assegnare la password. Assegnazione manuale dell'indirizzo IP (opzionale) 1. Acquisire un indirizzo IP non utilizzato sullo stesso segmento di rete del computer. 2. Selezionare la telecamera di rete dall'elenco. 3. Fare clic sul pulsante Assign new IP address to the selected device (Assegna un nuovo indirizzo IP alla periferica selezionata) e immettere l'indirizzo IP. 4. Fare clic su Assign (Assegna) e seguire le istruzioni visualizzate. Si tenga presente che la videocamera deve essere riavviata entro due minuti per impostare il nuovo indirizzo IP. 5. Fare clic sul pulsante Home Page (Pagina home) per accedere alle pagine web della telecamera. 6. Vedere a pagina 80 per le istruzioni sull'impostazione della password. 80 Pagina 80 Guida all'installazione AXIS P5532/P5534 Assegnazione degli indirizzi IP a più telecamere AXIS Camera Management facilita il processo di assegnazione degli indirizzi IP di più periferiche, suggerendo gli indirizzi IP in base a un intervallo specifico. 1. Selezionare le periferiche da configurare (è possibile selezionare più modelli) e fare clic sul pulsante Assign IP (Assegna IP). 2. Selezionare Assign the following IP address range (Assegna il seguente intervallo di indirizzi IP) e immettere l'intervallo di indirizzi IP, la subnet mask e il router predefinito utilizzati dalla periferica. 3. Fare clic su Update (Aggiorna). Gli indirizzi IP suggeriti sono elencati sotto a New IP Addresses (Nuovi indirizzi IP) e possono essere modificati selezionando una periferica e facendo clic su Edit (Modifica). 4. Fare clic su OK. Impostazione della password Per ottenere l'accesso al prodotto, è necessario impostare la password dell'utente amministratore predefinito root. Questa operazione può essere effettuata nella finestra di dialogo 'Configure Root Password' (Configura password root), che viene visualizzata quando si accede alla telecamera per la prima volta. Per evitare l'interruzione della connessione di rete durante l'impostazione della password root, è possibile eseguire questa operazione tramite la connessione crittografata HTTPS, che richiede un certificato HTTPS. Nota: HTTPS (Hypertext Transfer Protocol over SSL) è un protocollo utilizzato per crittografare il traffico tra i browser e i server web. Il certificato HTTPS controlla lo scambio crittografato di informazioni. Per impostare la password tramite una connessione HTTP standard, inserirla direttamente nella prima finestra di dialogo mostrata di seguito. Per impostare la password tramite una connessione HTTPS crittografata, attenersi alla seguente procedura. 1. Fare clic sul pulsante Create self-signed certificate (Crea certificato autofirmato). 2. Fornire le informazioni richieste e fare clic su OK. Il certificato viene creato e la password può essere ora impostata in modo sicuro. Da questo momento in poi tutto il traffico verso e dalla telecamera di rete viene cifrato. 82 Pagina 82 Guida all'installazione AXIS P5532/P5534 Accesso al flusso video Viene visualizzata la pagina Live View (Immagini dal vivo) con i collegamenti agli strumenti di configurazione che consentono di personalizzare la telecamera. Se necessario, fare clic su Yes (Sì) per installare AMC (Axis Media Control) che consente di visualizzare il flusso video in Microsoft Internet Explorer. A questo scopo è necessario disporre dei privilegi di amministratore. Se necessario, fare clic sul collegamento per installare i decodificatori mancanti. Nota: Per installare AMC in Windows 7/Windows Vista, è necessario eseguire Internet Explorer come amministratore. Fare clic con il pulsante destro del mouse sull'icona di Internet Explorer e selezionare Run as administrator (Esegui come amministratore). Setup (Configurazione): fornisce tutti gli strumenti necessari per configurare la telecamera. Help (Guida): visualizza la Guida in linea relativa alla modalità di utilizzo della telecamera. 84 Pagina 84 Guida all'installazione AXIS P5532/P5534 Assegnazione dell'indirizzo IP con ARP/Ping 1. Acquisire un indirizzo IP sullo stesso segmento di rete cui è connesso il computer in uso. 2. Individuare il numero di serie indicato sull etichetta della telecamera. 3. Aprire una finestra MS-DOS sul computer e digitare i seguenti comandi: Sintassi di Windows: arp -s <Indirizzo IP> <Numero di serie> ping -l 408 -t <Indirizzo IP> Sintassi di UNIX/Linux/Mac: arp -s <Indirizzo IP> <Numero di serie> temp ping -s 408 <Indirizzo IP> Esempio di Windows: arp -s c ping -l 408 -t Esempio di UNIX/Linux/Mac arp -s :40:8c:18:10:00 temp ping -s Verificare che il cavo di rete sia collegato alla telecamera, quindi avviare/riavviare la telecamera, scollegando e ricollegando l alimentazione. 5. Chiudere la finestra MS-DOS appena viene visualizzato il messaggio Reply from :... (Risposta da ) o altro messaggio simile. 6. Nel browser immettere IP> nel campo dell'indirizzo e premere Invio sulla tastiera. Note: Per aprire una finestra MS-DOS in Windows: dal menu Start, scegliere Esegui... e digitare cmd. Fare clic su OK. Per usare il comando ARP in Windows 7/Windows Vista, fare clic con il pulsante destro del mouse sull'icona della finestra MS-DOS e selezionare Esegui come amministratore. Per utilizzare il comando ARP in un sistema operativo Mac OS X, usare l utility Terminal, in Applicazioni > Utilità. 86 Pagina 86 Guida all'installazione AXIS P5532/P5534 Cavo multiplo (non incluso) Quando si connettono dispositivi esterni all'unità AXIS P5532/P5534, è necessario un cavo multiplo per mantenere la classificazione IP51 della telecamera. Il cavo multiplo può essere acquistato dal proprio rivenditore Axis. Connettere il cavo multiplo al connettore multiplo della telecamera, osservando l'illustrazione a pagina 71 e le istruzioni a pagina 73 e a pagina 74. Il cavo contiene i seguenti connettori: Connettore di alimentazione Morsettiera a 3 pin utilizzata per l'ingresso dell'alimentazione. Ingresso alimentazione CC V CC AXIS P5532: max 15 W AXIS P5534: max 17 W Ingresso alimentazione CA V CA AXIS P5532: max 20 VA AXIS P5534: max 23,6 VA Ingresso audio (rosa) Ingresso audio da 3,5 mm per microfono in mono o segnale mono line-in (il canale sinistro è usato da un segnale stereo). Uscita audio (verde) Uscita audio da 3,5 mm che può essere connessa a un sistema di indirizzo pubblico (PA), oppure ad un altoparlante con amplificatore integrato. Si possono collegare anche un paio di cuffie. Per l'uscita audio è necessario usare un connettore stereo. Morsettiera di I/O Utilizzata per varie applicazioni, come ad esempio la rilevazione del movimento, l'attivazione di eventi, la registrazione continua e la notifica di allarmi. Oltre all'alimentazione ausiliaria e al pin GND, ogni morsettiera ha 4 pin che possono essere configurati come ingressi o uscite. Questi pin forniscono l'interfaccia per: Uscita digitale: utilizzabile per collegare periferiche esterne come relè e LED. Le periferiche connesse possono essere attivate mediante la API (Application Programming Interface) VAPIX o i pulsanti di controllo nella pagina Live View (Immagini da vivo) oppure tramite Event Type (Tipo di evento). L'uscita verrà visualizzata come attiva (in Events (Eventi) > Port Status (Stato porta) se il dispositivo di allarme si attiva. 88 Pagina 88 Guida all'installazione AXIS P5532/P5534 Ripristino delle impostazioni predefinite Per reimpostare la telecamera alle impostazioni originali predefinite in fabbrica, utilizzare il pulsante di comando e il pulsante di riavvio sul lato della telecamera, vedere Panoramica dell'hardware, a pagina 70, come descritto di seguito: Utilizzando il pulsante di comando e il pulsante di riavvio, verranno ripristinati tutti i parametri, incluso l'indirizzo IP, alle impostazioni predefinite in fabbrica: 1. Rimuovere la copertura superiore, vedere Rimuovere l'imballo protettivo, a pagina Tenere premuti contemporaneamente i pulsanti di comando e di riavvio. 3. Rilasciare il pulsante di riavvio, continuando a tener premuto il pulsante di comando. 4. Continuare a tenere premuto il pulsante di comando fino a quando il colore dell'indicatore di stato non diventa giallo (l'operazione può richiedere fino a 15 secondi). 5. Rilasciare il pulsante di comando. 6. Quando l indicatore di stato diventa verde (l'operazione può richiedere fino a 1 minuto) la procedura è completata e la telecamera è stata ripristinata. L'unità ha ora l'indirizzo IP predefinito Rimontare il coperchio superiore della telecamera nella posizione originale. 8. Riassegnare l'indirizzo IP utilizzando uno dei metodi descritti in Assegnazione di un indirizzo IP, a pagina 77. È possibile inoltre ripristinare le impostazioni predefinite mediante l interfaccia web. Per ulteriori informazioni, leggere la guida in linea o la Guida per l'utente, disponibile sul CD del prodotto video di rete AXIS fornito insieme al prodotto. Accesso alla telecamera da Internet Dopo l'installazione, la telecamera di rete è accessibile dalla rete locale (LAN). Per accedere alla videocamera da Internet, è necessario configurare i router di rete per consentire il traffico in entrata, che di norma avviene su una porta specifica. Porta HTTP (porta predefinita 80) per la visualizzazione e la configurazione Porta RTSP (porta predefinita 554) per la visualizzazione di flussi video in formato H.264 Per ulteriori istruzioni, consultare la documentazione del router. Per maggiori informazioni su questo e altri argomenti, visitare il sito web per il supporto Axis all indirizzo Ulteriori informazioni La Guida per l utente è disponibile sul sito web di Axis all indirizzo oppure sul CD del prodotto video di rete AXIS fornito con il prodotto. Suggerimento Visitare il sito di Axis all indirizzo per verificare se sono stati pubblicati aggiornamenti per la telecamera di rete. Per conoscere la versione installata del firmware, vedere >About (Informazioni su) nella pagina Setup (Configurazione). 92 Página 92 AXIS P5532/P5534 Guía de instalación Instalación del hardware! IMPORTANTE: Para utilizar la cámara AXIS P5532/P5534 en exteriores, debe instalarse en una carcasa para exterior aprobada. Para obtener más información sobre carcasas para exteriores, consulte la página Preparación para la instalación Lea todas las instruciones de instalación antes de prepararse para instalar la cámara AXIS P5532/ P5534, puesto que varios de los pasos de preparación para la instalación requieren que se retire la cubierta superior y es recomendable llevarlos a cabo todos juntos. Siga las instrucciones de la sección Retirada del embalaje de protección a continuación para retirar el embalaje de protección antes de instalar la cámara. La cámara se suministra con una cubierta transparente clara y otra ahumada. En caso necesario, siga las instrucciones de la sección Sustitución de la cubierta clara/ahumada del domo (opcional) a continuación para sustituir la cubierta del domo. Es necesaria una tarjeta SD estándar o de alta capacidad (no incluida) para guardar las imágenes localmente en la cámara de red. Siga las instrucciones de la sección Instalación de una tarjeta SD (opcional) a continuación para retirar la cubierta superior e instalar una tarjeta SD. Retirada del embalaje de protección 1. Afloje los 4 tornillos de la cubierta superior y retírela, consulte la ilustración en la página Retire el embalaje de protección. Embalaje de protección 3. Si va a sustituir la cubierta clara/ahumada del domo o va a instalar una tarjeta SD, consulte las instrucciones de las secciones Sustitución de la cubierta clara/ahumada del domo (opcional) y Instalación de una tarjeta SD (opcional) a continuación. 4. Vuelva a colocar la cubierta superior en su posición original y apriete los tornillos. 93 AXIS P5532/P5534 Guía de instalación Página 93 Sustitución de la cubierta clara/ahumada del domo (opcional) 1. Afloje los 4 tornillos de la cubierta superior y retírela, consulte la ilustración en la página Quite los 6 tornillos del anillo del domo y retírelo de la cubierta superior. 3. Fije el anillo y la cubierta del domo a la cubierta superior y asegúrelos apretando los 6 tornillos. 4. Si va a instalar una tarjeta SD, consulte las instrucciones de la sección Instalación de una tarjeta SD (opcional) a continuación. 5. Vuelva a colocar la cubierta superior en su posición original y apriete los tornillos. Nota: Tenga cuidado de no arañar ni dañar la cubierta del domo. Utilice un paño suave para limpiar antes de unir la cubierta del domo a la unidad de cámara. Instalación de una tarjeta SD (opcional) 1. Afloje los 4 tornillos de la cubierta superior y retírela, consulte la ilustración en la página Inserte una tarjeta SD (no incluida) en la ranura para tarjeta SDHC (Secure Digital High Capacity). 3. Vuelva a colocar la cubierta superior en su posición original y apriete los tornillos. Nota: La tarjeta SD se instala automáticamente al insertarla en la ranura para tarjeta SDHC. No obstante, antes de retirar la tarjeta SD se debería desinstalar mediante las páginas web de la cámara. Vaya a Setup > System Options > Storage > SD Card (Configuración > Opciones de sistema > Almacenamiento > Tarjeta SD) y haga clic en Unmount (Desinstalar). Para obtener más información, consulte el Manual del usuario disponible en el CD de productos de vídeo en red de AXIS suministrado con este producto o en el sitio web Montaje en techo duro 1. Prepare el techo para la instalación de la placa de montaje; utilice la plantilla de taladrado suministrada para situar los orificios. Asegúrese de utilizar las brocas, los tornillos y los tacos adecuados para el material. 2. Instale la placa de montaje. Placa de montaje ESPAÑOL Cable de seguridad 3. Afloje los 4 tornillos de la tapa de la base de la cámara y retírela, consulte la ilustración en la página 91. 94 Página 94 AXIS P5532/P5534 Guía de instalación 4. Pase el cable de red y el cable multiconector, si procede, y conéctelos a la cámara de red. Tenga cuidado de no dañar los cables al conectarlos. Asegúrese de que los orificios de la junta de espuma coincidan con las guías para el cable y, si procede, retire de la junta de espuma la pieza extraíble para el cable multiconector. 5. Vuelva a colocar la tapa de la base de la cámara en su posición original y apriete los tornillos. 6. Fije la cámara mediante el cable de seguridad suministrado. 7. Deslice los módulos de unidad de la cámara de red por las ranuras de la placa de montaje y gire la unidad de cámara. 8. Instale el midspan High PoE de 1 puerto, consulte la sección Instalación del midspan High PoE AXIS T8123 con 1 puerto, en la página Compruebe que los indicadores LED del midspan indiquen las condiciones correctas, consulte la tabla de la página 108 para obtener más información. Montaje en falso techo 1. Retire el azulejo del techo donde se instalará el montaje del techo falso. 2. Utilice la plantilla proporcionada para marcar la posición del orificio de 210 mm en el azulejo. Recorte la plantilla. Azulejo del techo Diámetro del orificio 210 mm Notas: El peso de la cámara junto con el montaje del techo es de aproximadamente 2,3 kg. Asegúrese de que el material del techo puede aguantar este peso. El grosor del azulejo del techo debe ser de entre 5 y 60 mm. 3. Monte la escuadra de techo. 4. Coloque la escuadra de techo en el azulejo, consulte la ilustración en la página Apriete los tornillos para el brazo de la escuadra con un destornillador torx Afloje los 4 tornillos de la tapa de la base de la cámara y retírela, consulte la ilustración en la página 91. 95 AXIS P5532/P5534 Guía de instalación Página Pase el cable de red y el cable multiconector, si procede, y conéctelos a la cámara de red. Tenga cuidado de no dañar los cables al conectarlos. Asegúrese de que los orificios de la junta de espuma coincidan con las guías para el cable y, si procede, retire de la junta de espuma la pieza extraíble para el cable multiconector. Cable multiconector Cable de red 8. Vuelva a colocar la tapa de la base de la cámara en su posición original y apriete los tornillos. 9. Fije la cámara mediante el cable de seguridad suministrado. Escuadra de techo Cable de seguridad Azulejo del techo ESPAÑOL 10. Deslice los soportes de unidad de la cámara de red por las ranuras de la placa de montaje y gire la unidad de cámara. 11. Instale el midspan High PoE de 1 puerto, consulte la sección Instalación del midspan High PoE AXIS T8123 con 1 puerto, en la página Compruebe que los indicadores LED del midspan indiquen las condiciones adecuadas. Para obtener información más detallada, consulte la tabla de la página Instale el azulejo, con la cámara montada, en el techo. 96 Página 96 AXIS P5532/P5534 Guía de instalación 14. Coloque el anillo embellecedor sobre la escuadra de techo y presione hasta que encaje. Anillo embellecedor Montaje con escuadra (accesorio opcional) 1. Instale la escuadra seleccionada según las instrucciones que se suministran con ella. Si es necesario taladrar, asegúrese de utilizar las brocas, los tornillos y los tacos adecuados para el material. 2. Afloje los 4 tornillos de la tapa de la base de la cámara y retírela, consulte la ilustración en la página Pase el cable de red y el cable multiconector, si procede, por los orificios de la escuadra de montaje. 4. Enganche la cámara al cable de seguridad de la escuadra. Cable de seguridad Ranuras para los soportes de unidad Escuadra de pared (ejemplo de montaje) Tornillos torx T30 5. Conecte el cable de red y el cable multiconector, si procede, a la cámara de red. 6. Instale el dispositivo AXIS T8123, consulte la sección Instalación del midspan High PoE AXIS T8123 con 1 puerto, en la página Vuelva a colocar la tapa de la base de la cámara en su posición original. 8. Deslice los soportes de unidad de la cámara de red por las ranuras de la escuadra y gire la unidad de cámara. 9. Fije la cámara de red a la escuadra de montaje apretando los 3 tornillos (torx T30). 98 Página 98 AXIS P5532/P5534 Guía de instalación Asignación de una dirección IP Actualmente, la mayoría de redes disponen de un servidor DHCP que asigna direcciones IP a los dispositivos conectados de forma automática. Si su red no dispone de un servidor DHCP, la cámara de red utilizará como dirección IP predeterminada. 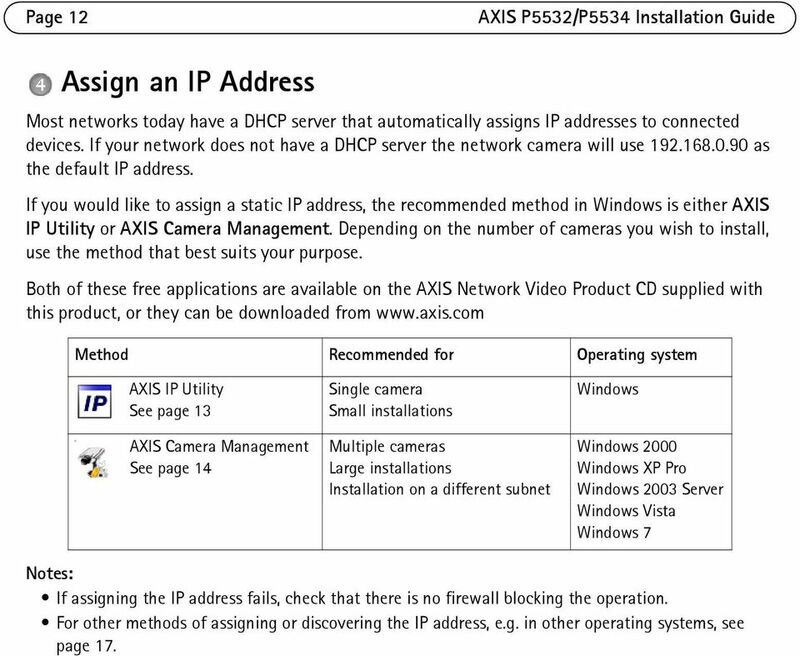 Si desea asignar una dirección IP estática, el método recomendado en Windows es AXIS IP Utility o AXIS Camera Management. En función del número de cámaras que desee instalar, deberá utilizar el método que se adapte mejor a sus necesidades. Ambas aplicaciones son gratuitas y están disponibles en el CD de productos de vídeo en red de AXIS suministrado con este producto, o pueden descargarse de Método Recomendado para Sistema operativo AXIS IP Utility Consulte la página 99 AXIS Camera Management Consulte la página 100 Cámaras individuales Instalaciones pequeñas Varias cámaras Instalaciones grandes Instalación en una subred diferente Windows Windows 2000 Windows XP Pro Windows 2003 Server Windows Vista Windows 7 Notas: Si no puede asignar la dirección IP, compruebe que no haya ningún cortafuegos que bloquee la operación. Para ver otros métodos de asignar o detectar la dirección IP, p. ej., en otros sistemas operativos, consulte la página 104. 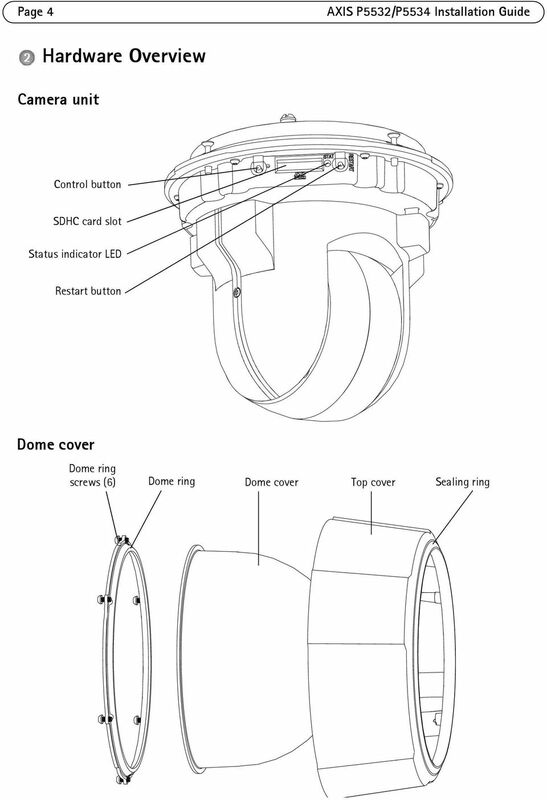 INSTALLATION GUIDE AXIS P5522 PTZ Dome Network Camera ENGLISH FRANÇAIS DEUTSCH ITALIANO ESPAÑOL Legal Considerations Video and audio surveillance can be prohibited by laws that vary from country to country. Markengeschichte. Hingabe unterscheidet uns. Hartnäckigkeit beschreibt uns. 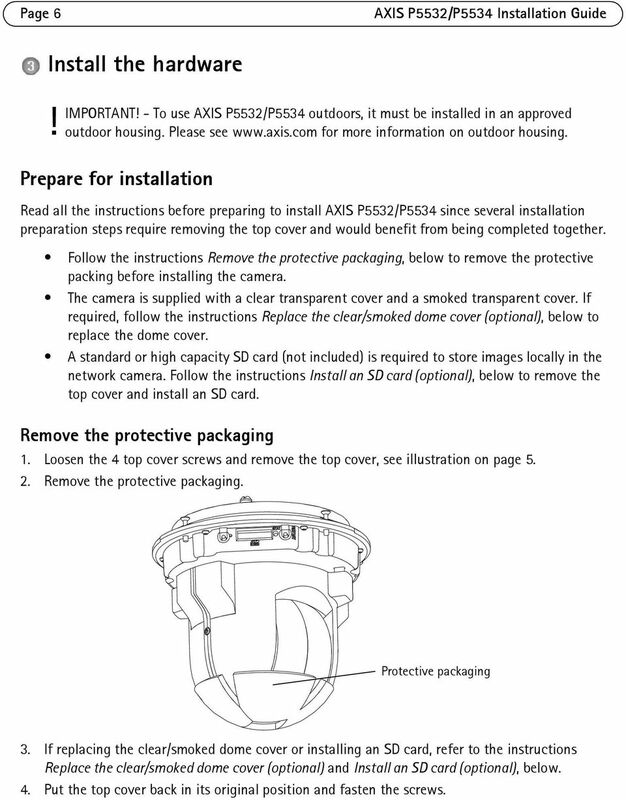 INSTALLATION GUIDE AXIS Q6034 PTZ Dome Network Camera ENGLISH FRANÇAIS DEUTSCH ITALIANO ESPAÑOL Legal Considerations Video and audio surveillance can be prohibited by laws that vary from country to country. 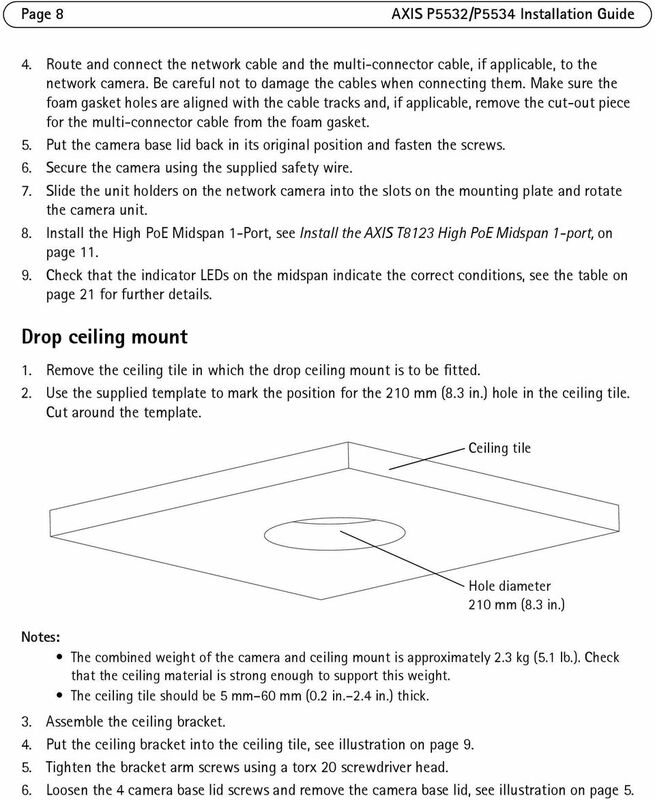 INSTALLATION GUIDE AXIS P5512 PTZ Dome Network Camera ENGLISH FRANÇAIS DEUTSCH ITALIANO ESPAÑOL Legal Considerations Video and audio surveillance can be prohibited by laws that vary from country to country. 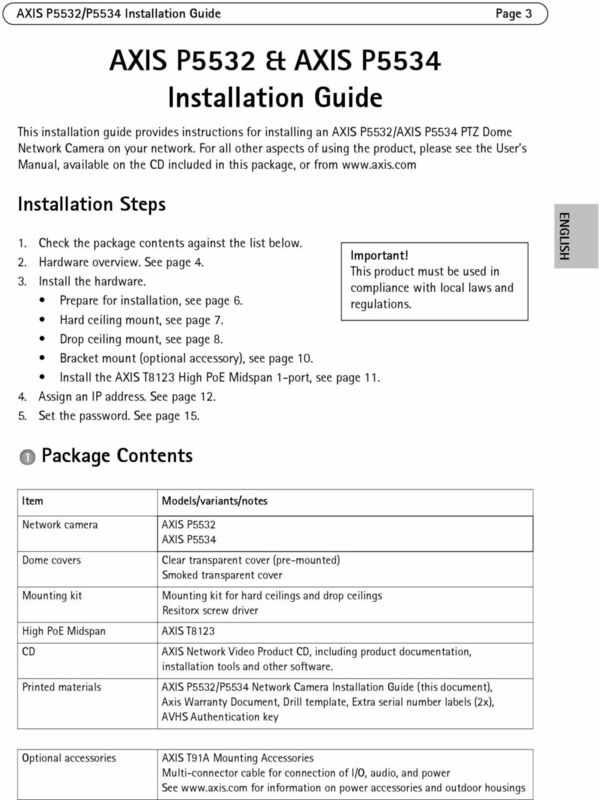 INSTALLATION GUIDE AXIS P5512-E PTZ Dome Network Camera ENGLISH FRANÇAIS DEUTSCH ITALIANO ESPAÑOL Legal Considerations Video and audio surveillance can be prohibited by laws that vary from country to country.